Following the recent ban of bus traffic in the downtown area, the City of Reykjavik has decided to expand on it. The Downtown area will now feature thirteen designated bus stops, all located at the edges of the ban zone. City council estimates that “80% of accommodation within the affected area are within 200 meters from the closest [bus stop]”. NOTE: Bus stop 4 is closed due to construction until further notice. Please go to Bus stop 1 by City Hall until then. NOTE: The pickup time might vary. Please get in touch with us (info@gtice.is) for the exact time. If you need help to find the closest hotel to your private accommodation, do not hesitate to contact us. Please be ready at your designated pickup location from the beginning of the pickup time. Pick-up times are given in the tours’ descriptions and generally take up to 30 minutes. However, due to traffic conditions or having to locate guests, pickups may take longer. Please make sure you do not board another company’s van or coach. Some do not check your voucher, and if you are not at the designated pickup location, we must not delay other guests. 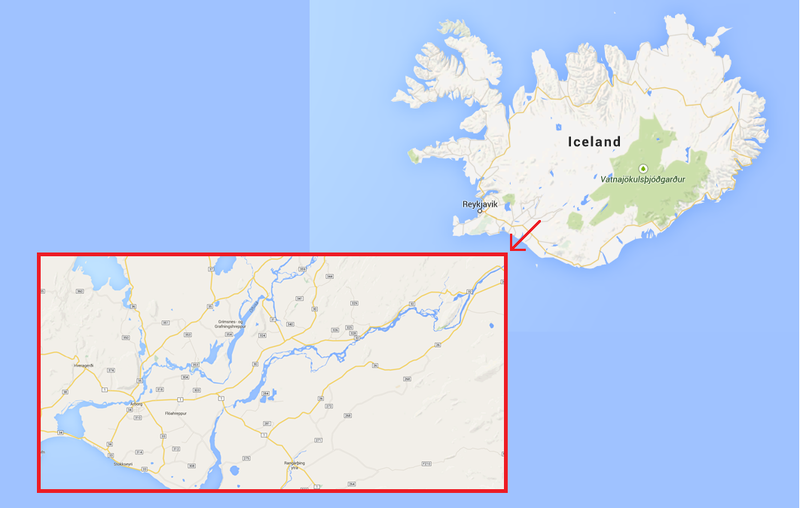 As you might have heard it already, no one comes to Iceland only once. Maybe it’s the locals, maybe it’s the culture, but something about Iceland makes people coming back for more. And as every season offers a unique experience and incredible sights specific for a single season, it is hard to find a reason not to come back again. 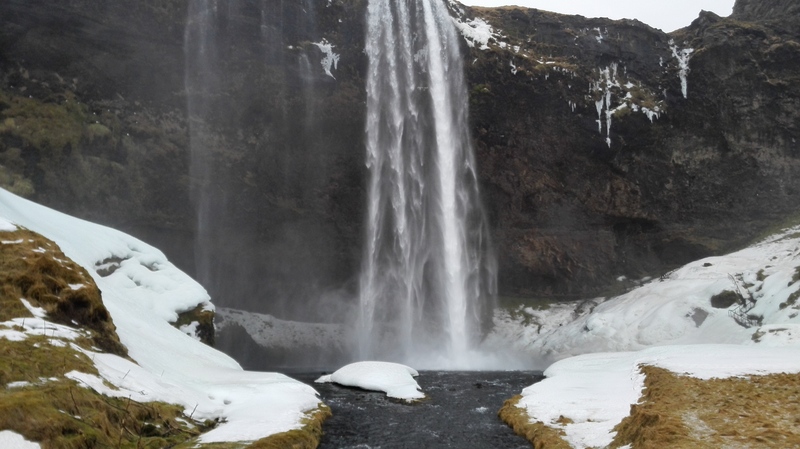 However, if you are looking into booking your first ever trip to Iceland and want to see as much as you possible can go with March/April, in Iceland known as – spring! 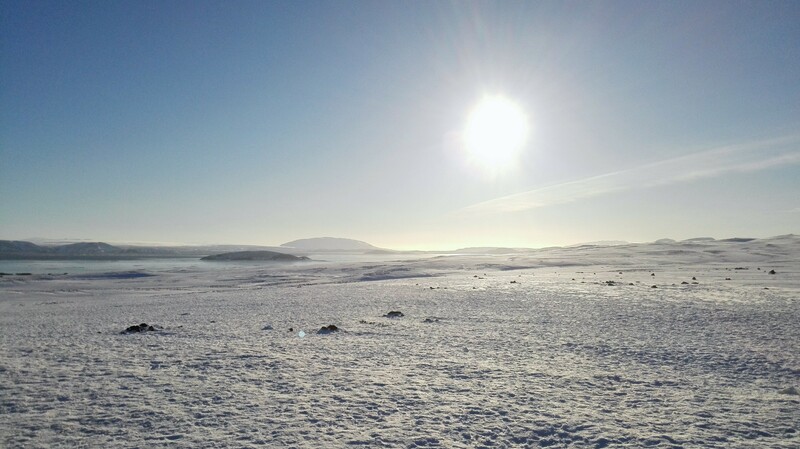 Winters in Iceland are usually cold, windy and full of snow – truly a winter wonderland. Spring, on the other hand, is the time when you can feel the nature waking up! The spring flowers are slowly showing themselves, trees are putting on new “leaf-dresses” and the weather is definitely picking up. This is all thanks to the Gulf Stream bringing in the warm winds from the Gulf of Mexico and making Iceland surprisingly warm. However the presence of glaciers, reflecting the sunlight back into the atmosphere, cools down the surrounding land which gives for an unpredictable weather. This is when the Icelandic saying “If you don’t like the weather, just wait 5 minutes” will come in quite handy. But this is all a part of the Icelandic charm as you will be able to take photos of snowy mountain tops with the Sun shining over the landscape. 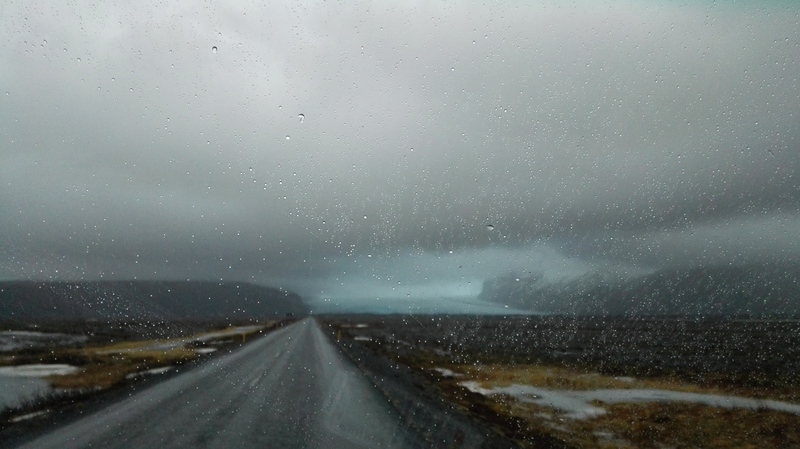 You will get to see all of the Icelandic weather, easily. When the national TV shows loa sighting, it means the spring is upon us and you will soon be able to enjoy the wildlife. Throughout the year, one can easily spot the most common domesticated animals: sheep, horses and cats. 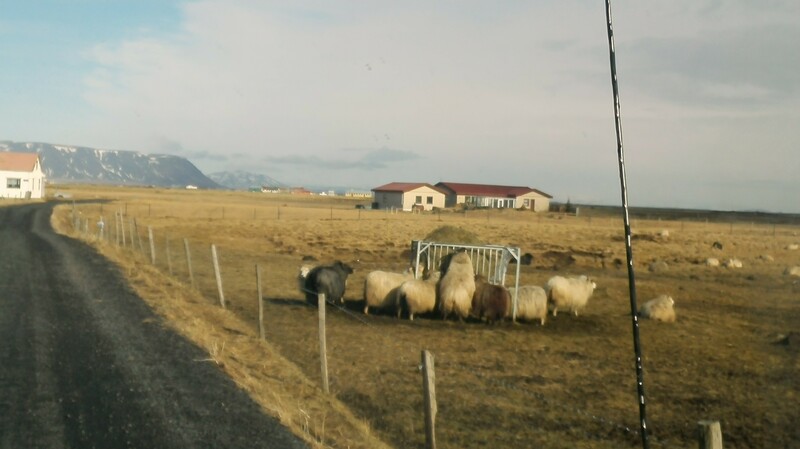 Icelandic sheep are let go to wander throughout the summer months. This makes for delicious meat and extremely high quality wool that the locals use to make the ever-popular lopapeysa – Icelandic traditional woolen sweater. 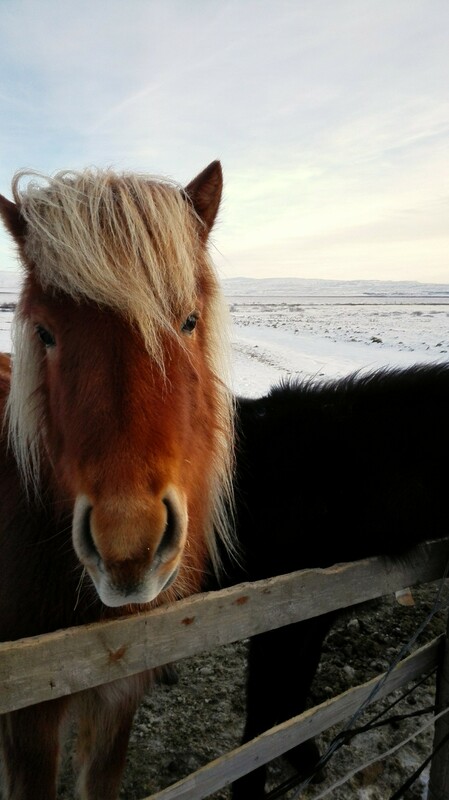 Icelandic horses are world-renowned as well – partially because of their pony-size but mainly because they have 5 gaits. 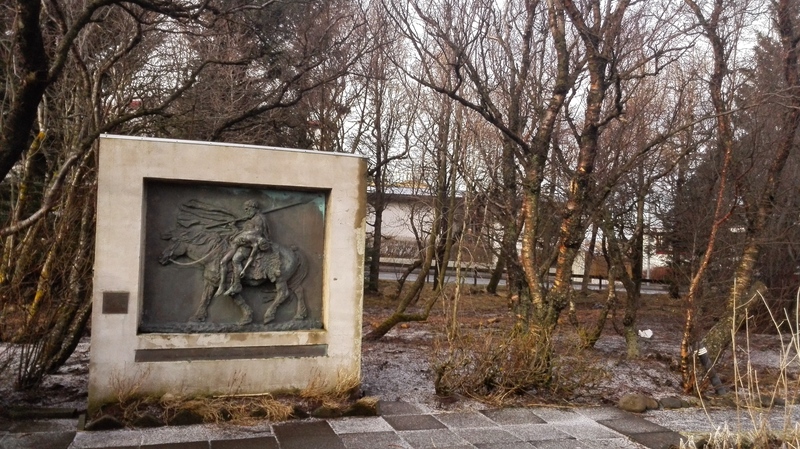 Make sure to try tölt if you decide to take a horse-riding tour during your visit. Wildlife, though scarce, is incredible as anywhere else. If you like spending your time outdoor, and you are feeling lucky, you might spot an arctic fox – the only land mammal native to Iceland. 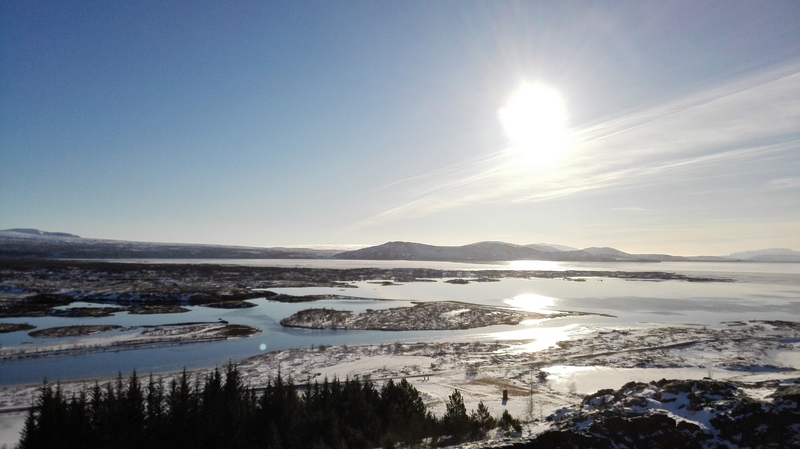 This might be a good time for you to travel all around our little island, in which case, when you find yourself in the eastern part you might see a reindeer (there are only 3000 of those in the whole country). 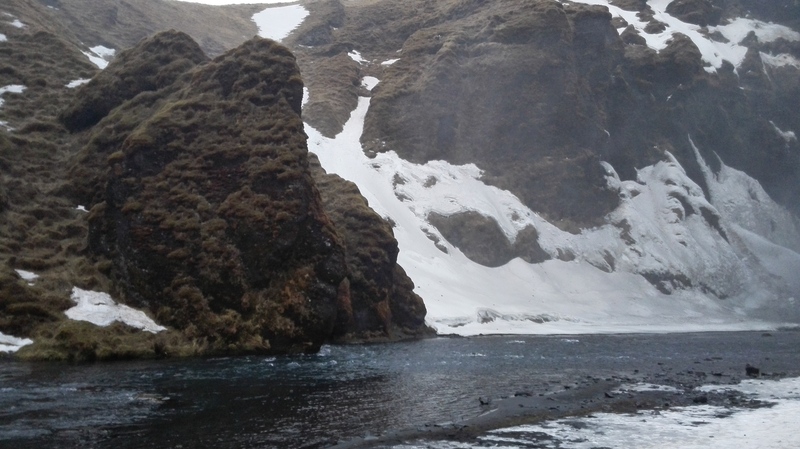 If you prefer sea creatures, you can always book a tour and go whale-watching, just in the vicinity of the capital Reykjavik or take your chances and visit some of the popular places to see the seals, like Ytri Tunga in Snæfellsnes. Not only is the nature waking up, but in the spring you are blessed with longer daylight allowing you to enjoy it the best way possible. As we go from 4h of daylight in winter to 16h of daylight in spring, it is the most normal you will get when it comes to the “normal day”. This can be important if you have difficulties sleeping/staying awake as both problems are persistent among locals during summer/winter. The first day of Harpa – seventh month in the old Norse calendar – signifies the beginning of summer. Albeit, that same calendar divided the year in only 2 seasons: dark winter and light summer. For Icelanders, this is a public holiday that people spend enjoying various outdoor activities: mainly heading out for an ice-cream (preferably in summer clothes) or embracing the “grilling weather”. That’s right – we do love our summers and although the temperatures are far from those typical in the summer, nothing can stop us from celebrating this season. Even the fact it’s still not summer. Off-season in Iceland basically brings together the best out of both worlds; on one hand the landscape is still covered in snow, ice is nicely fitting all the famous waterfalls, less tourists are blocking your view or filling up your hostel room; on the other hand the temperatures are higher, the days are longer and the weather generally better. But let us elaborate on 2 important things there. 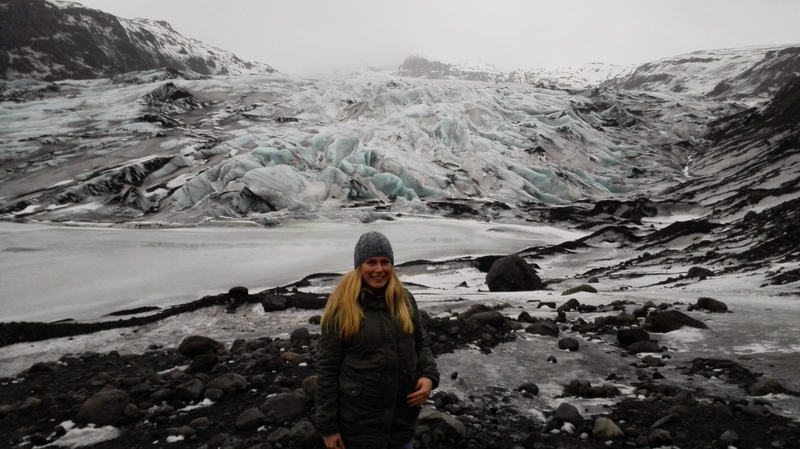 To describe tourism in Iceland as booming might as well be an understatement as the country has been seeing the annual increase in the number of tourists between 15 and 25%. 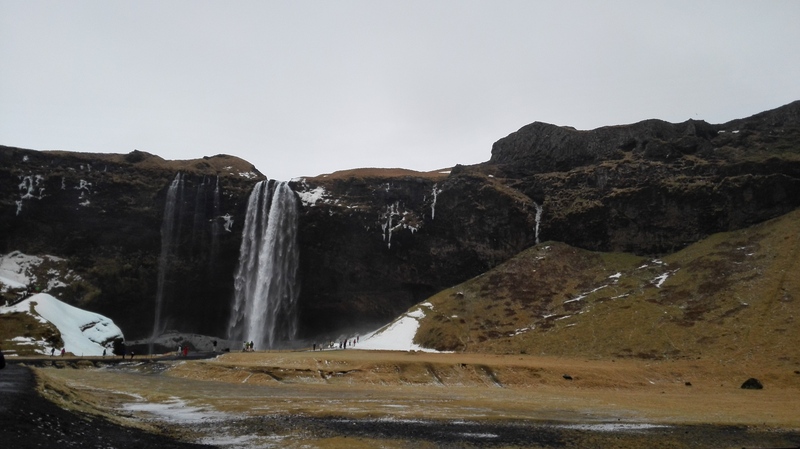 Just last year we have welcomed around 5 times more tourists than there are locals and although Iceland is magical, there are certain struggles in dealing with this rapid growth on which we can’t use our magic wand. The biggest increase is visible in the summer months, as well as around the Christmas holidays. Longer days also mean more time to spend looking around exploring the country. This time might be the best to do day trips to slightly remote places like Jökullsarlón/Glacier Lagoon. 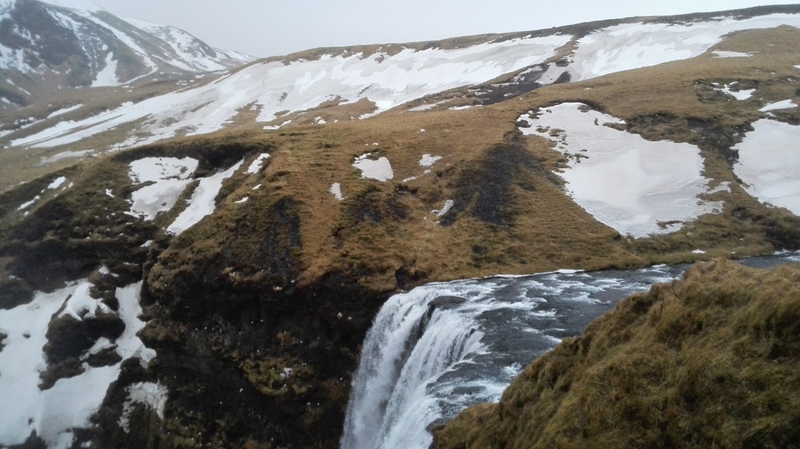 Though the weather might not be permitting to do the most famous Icelandic hikes, Skaftafell National Park offers a couple of short hikes, most popular being the one to the beautiful Svartifoss (“Black Falls”). On top of that, during spring it’s easier to find accommodation which is, also, significantly cheaper. The same goes for the flight tickets that supposedly drop up to 20%. Visiting this quite isolated island in the North for some is not enough so they venture further in search for some peace of mind. 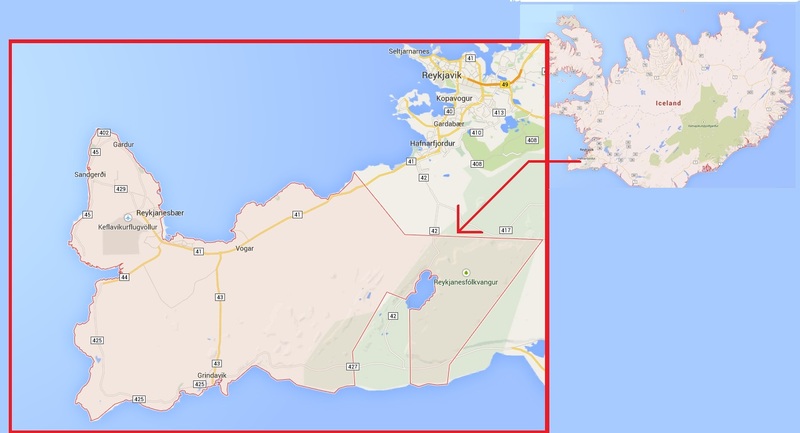 You should know that around 2/3 of the total population live in Greater Reykjavik Area and if there are not many tourists visiting, the rest of the island is scarcely populated giving you ample space for your personal journey. Everyone starts their year by making their New Year’s Resolutions which usually include: more traveling and more exercise. Why not start the new year by a visit to “The Land of Ice and Fire”, where you can find both and much, much more? 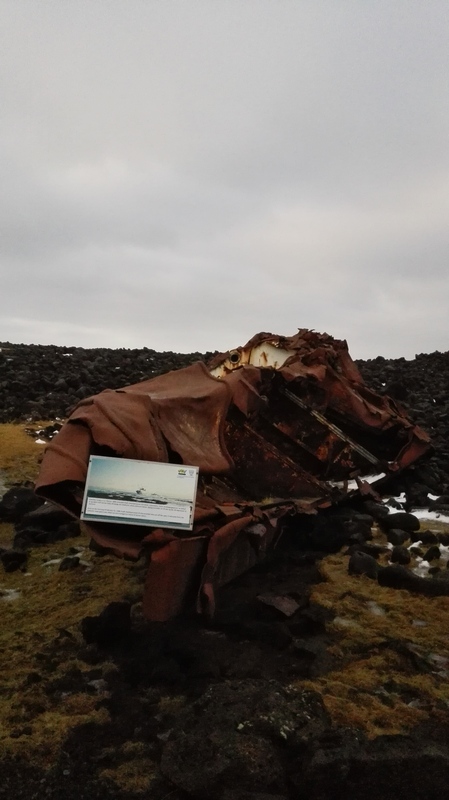 It has already been a while, but I finally went on another tour over the weekend – Snaefellsnes Peninsula, the home of Snæfellsjökull. This volcano/glacier was made famous by Jules Verne, serving as the entrance to the center of the Earth in his novel “Journey to the Center of the Earth”. I previously attempted going on this tour, last weekend, however, before the tour could officially start we had to turn back because the weather had changed for the worst. The guide then was Baldur – quite a good guide, telling stories along the way, and combining them with a good sense of humor. Most importantly he was a good driver and he managed to get us back to Reykjavik safely, despite the stormy weather. Yesterday’s tour was guided by Gummi. After being picked up last, we left the city and headed north. Today we had a group of sixteen including myself, and everyone on the tour today was exceptionally kind. Gummi was telling his stories even before leaving the city, while the landscape became more and more beautiful. 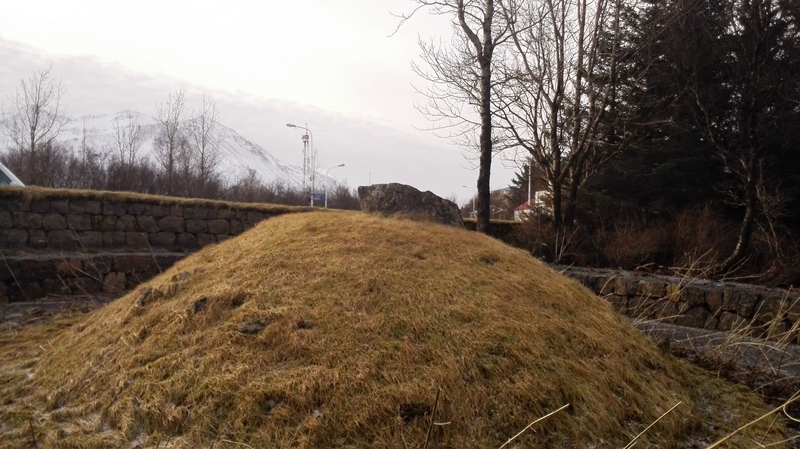 We first stopped in Borgarnes for a coffee break, after which we went into the small town to see the burial mound of Skalla-Grímur Kveldúlfsson, which can be found in a small park. After walking around this pleasant little park, we got back on the bus and Gummi took us to a ‘sod house’ which can also be found in this town. Once we arrived here Gummi started telling us about the houses, and why they were built the way they were. He took us all inside and we barely fit there! 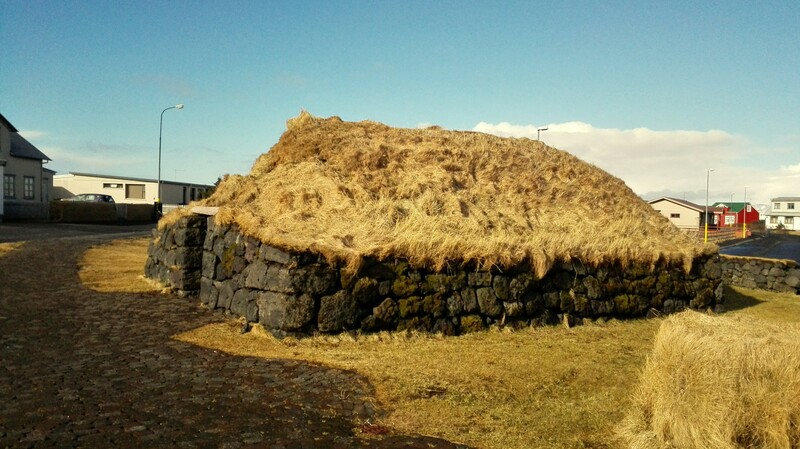 We got to see how the structure was built as he told us about some of the customs concerning building houses in the Viking era. We walked around for some time, and as soon as everyone had taken enough pictures, we left Borgarnes behind to continue to our next destination. 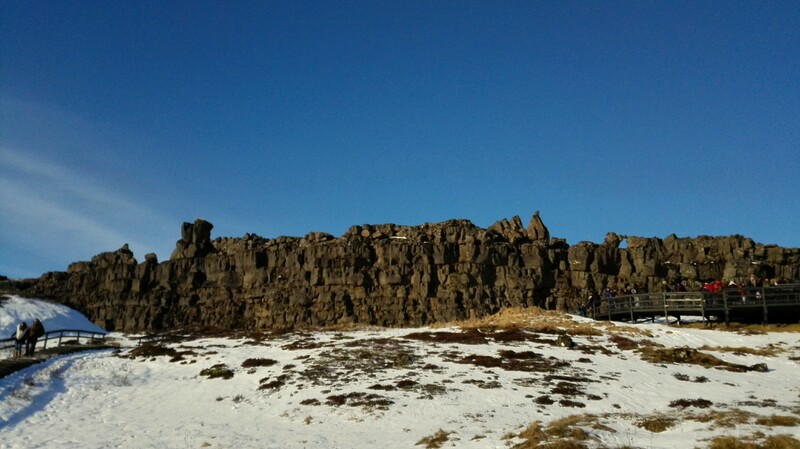 The next stop was a wall of basalt columns, where we made a brief stop to take pictures. 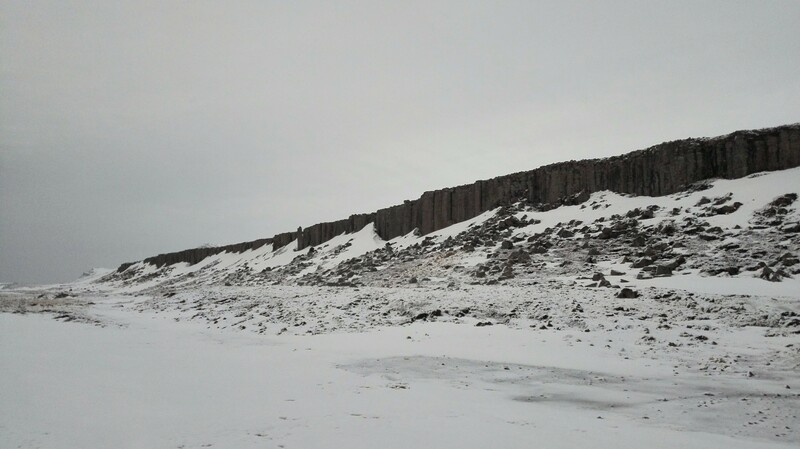 This enormous natural wall was surrounded by beautiful snow-covered landscapes, so it took some time before we were all back on the bus, with plenty of pictures taken from this site. 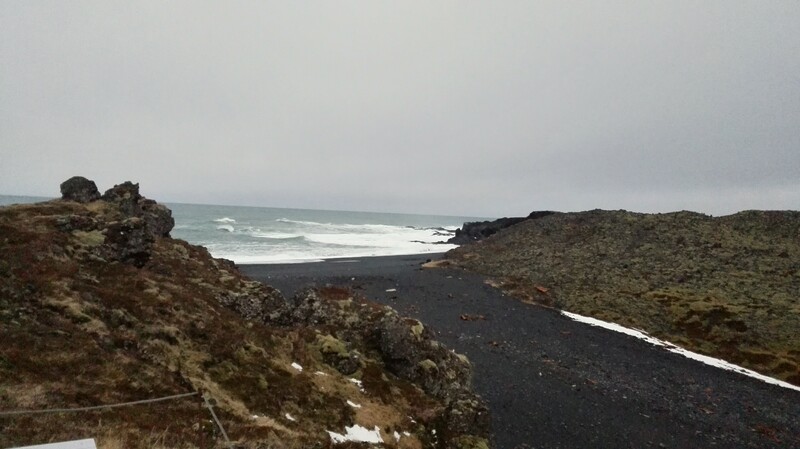 We then continued for Breidafjordur (“Breiðafjörður”) beach, which is quite a unique beach for Iceland. This beach happens to be one of the few beaches in Iceland to have white sand instead of black sand. 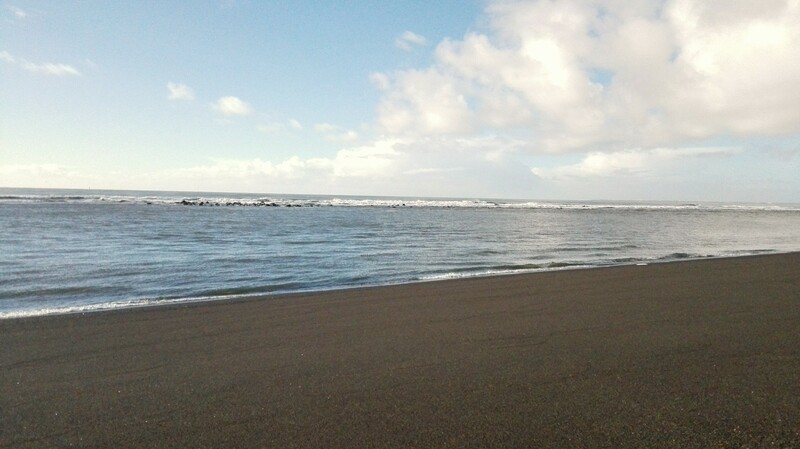 This is due it being a shell beach instead of a lava-stone beach. The beach itself looked like no beach I had ever seen – the sand was not as white as other beaches, but more a darker shade of yellow. 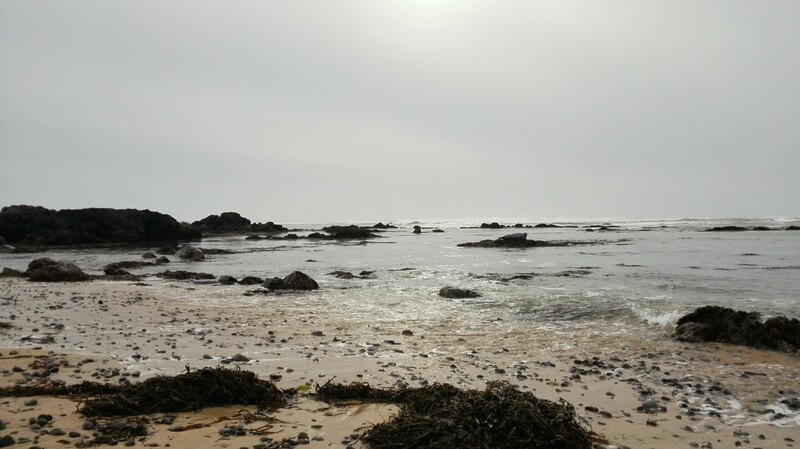 As we walked towards the shoreline, Gummi told us to keep our eyes open, since it would be possible to spot seals on this beach. He was right! 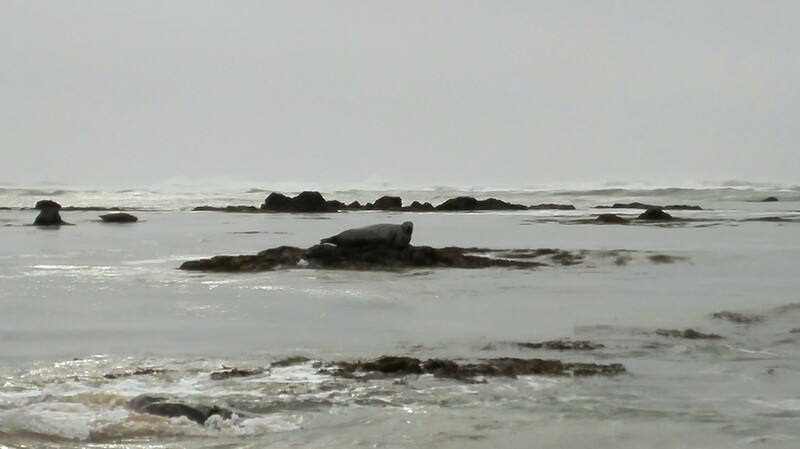 As soon as we got closer, we did see two seals relaxing on the rocks in the water. We spent the time taking pictures of the seals, trying our best not to scare them off. Gummi, meanwhile, used his set of binoculars to see if there were any other seals around. As soon as he spotted the others, he passed his binoculars on to us, pointing where to look. While telling us, even more, stories, and answering all the questions, Gummi drove us to a very beautiful little waterfall. 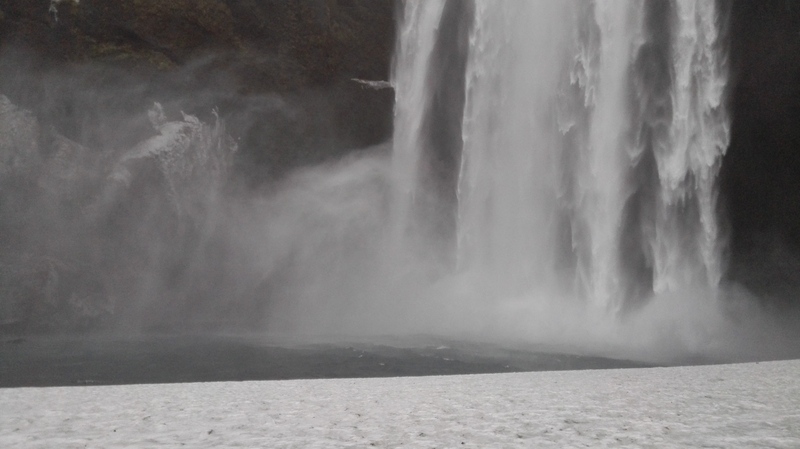 While driving towards it, we were not able to see this waterfall, as you can only see it from other directions. So Gummi stopped to give us the opportunity to take proper pictures. I was soon starting to get quite hungry. When Gummi told us our next stop would be lunch – it sounded like music to my ears. I saw other sharing the same feeling. 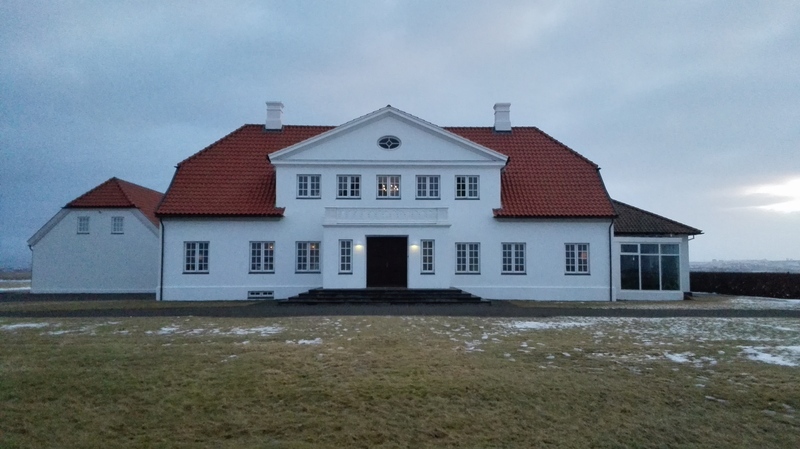 He took us to a lovely hotel, called Búðir, where we had the choice between a fish course and soup. I chose the fish course, which was quite good! After lunch, I walked around the hotel for a while. 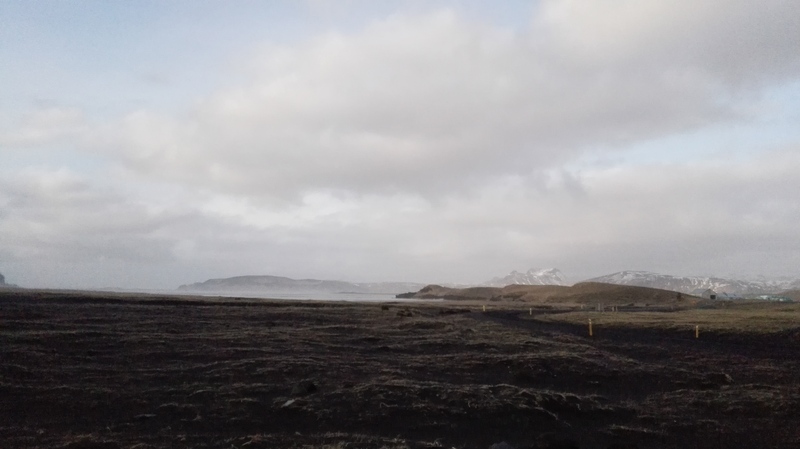 The location is really beautiful, looking out over the ocean as well as on the Snæfellsjökull. 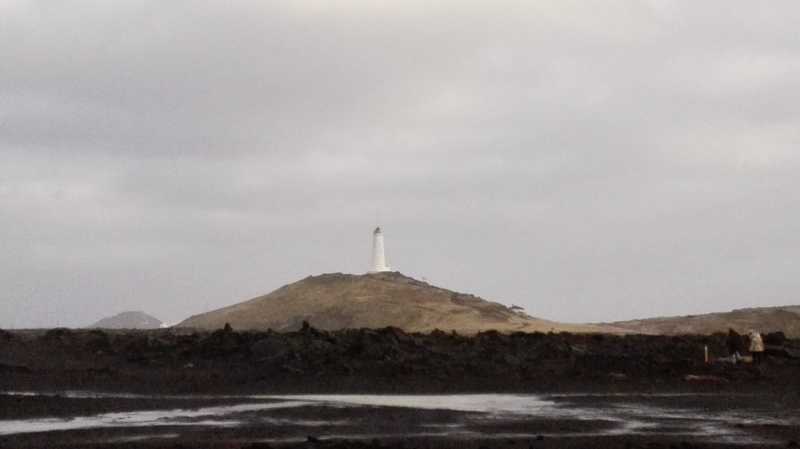 While driving us into the town Arnarstapi, Gummi told us the story of Bárður Snæfellsás – half man, half troll – who eventually disappeared into the Snæfellsjökull Icecap. Gummi stopped at the base of his statue and e told us we would be going for a hike. 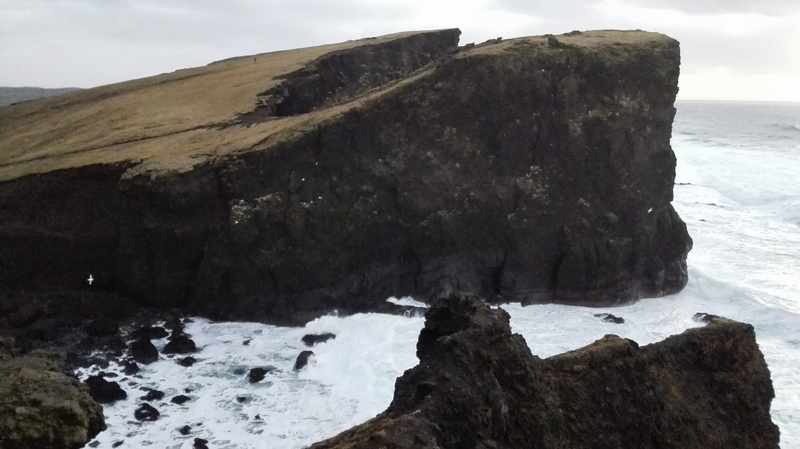 We walked for a short while to a viewing point, where we had an amazing view of the extraordinary coastline. Apparently, one can see whales from here, quite often. Sadly no whales were to be seen that day. 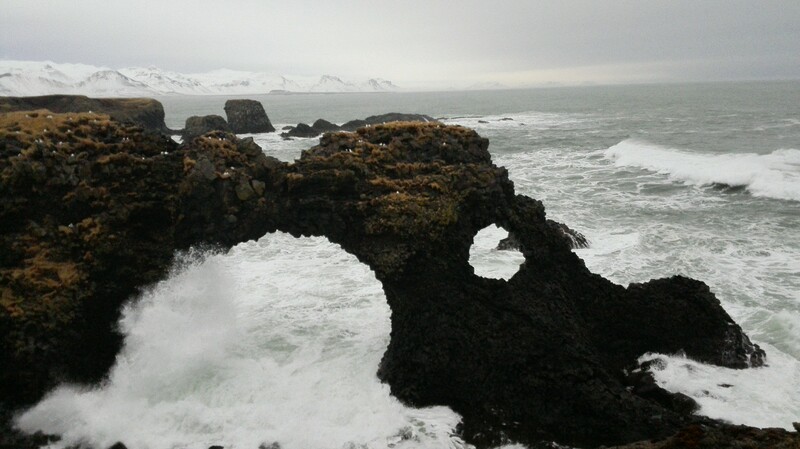 We continued our walk along the coastline, to the place where we could see the wonderful rock formation of an arch in the water. 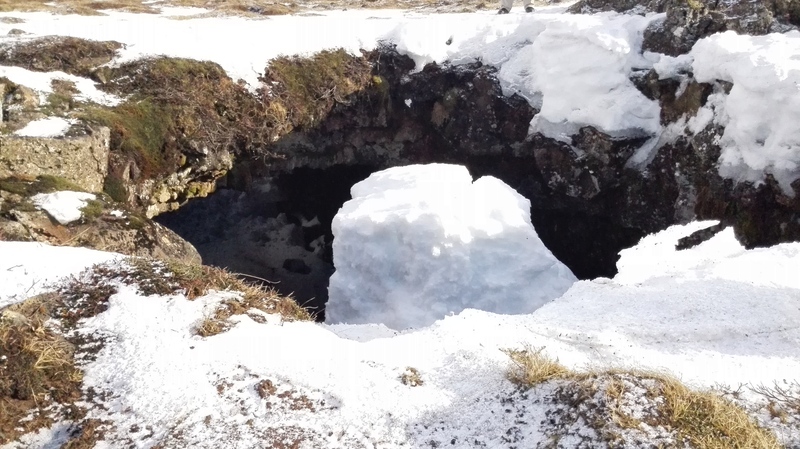 Further on, Gummi showed us a hole in the ground, where the water flowed to and led us to the other side of it to see it from a different angle. As we got nearer to the edge on the other side it became clear that we had just walked across another arch, without even noticing. 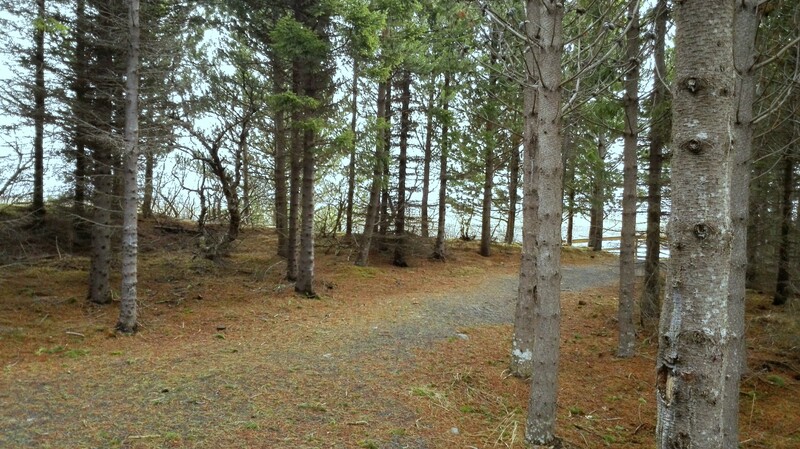 The hike along this beautiful shoreline ended at an enchanting little harbor, where Gummi picked us up with the bus. When we were back on the bus everyone was thankful for the warmth because it was starting to get quite cold outside. Seeing we were all a bit cold, Gummi decided to take us to a small café in town, which used to be the community center. We drank some chocolate milk, made from real Icelandic chocolate, with homemade whip cream, a real treat to get warm. 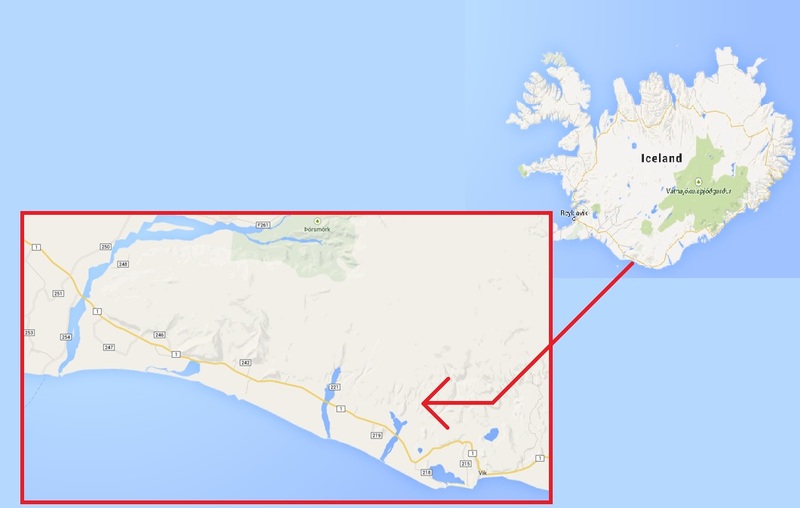 We then continued for Djupalonssandur (Djúpalónssandur), while Gummi told us about its history as a fishing village. We walked up to the shore to enjoy the view, and Gummi continued his story here. By now the wind was coming up really strong, making it much colder every minute. So after a far too short time making pictures of this wonderful place, we hurried back on the bus. 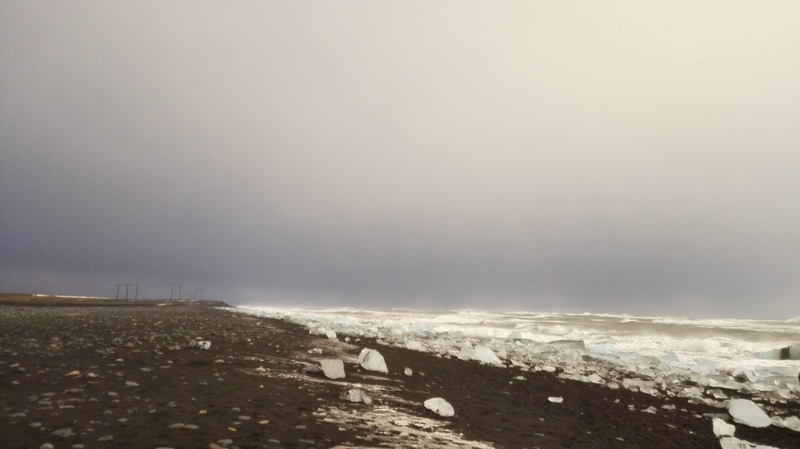 We were then headed back to Reykjavik, and as soon as we got around the North side of the Peninsula, the weather had gotten much worse. We arrived back in Reykjavik safe and sound a few hours later, being able to look back on a wonderful day filled with magical sceneries. 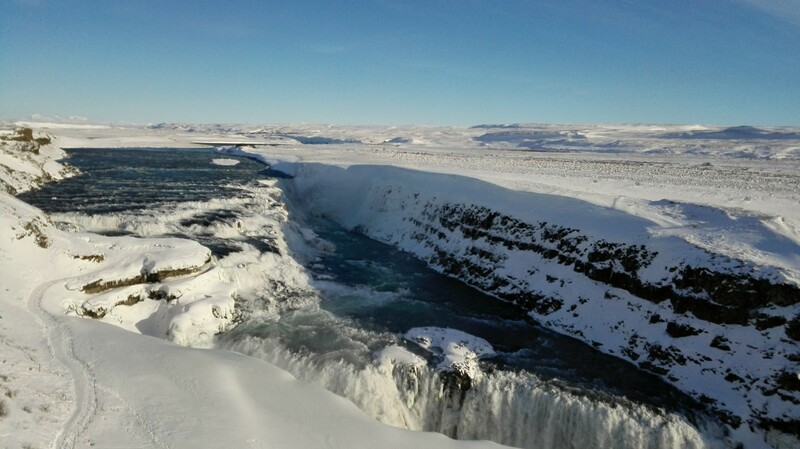 Tour time again on Saturday – this time I would be going on the Hot Golden Circle tour. 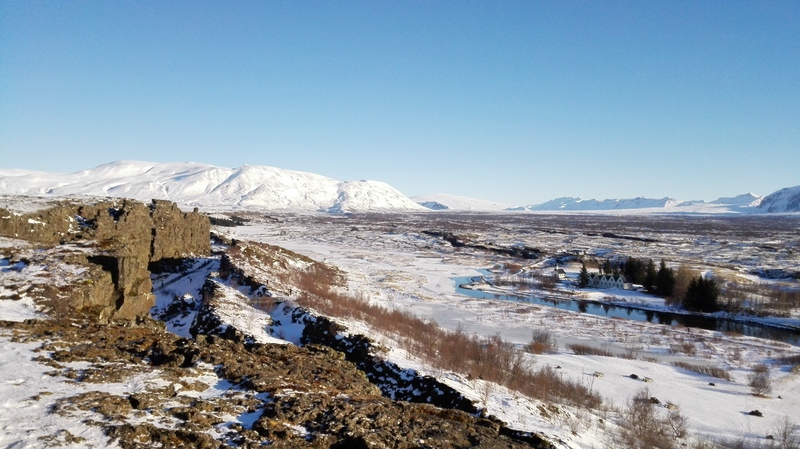 The Golden Circle is the most popular tour in Iceland and every touring company has their own variation of this tour, which features Iceland’s most important tourist attractions. 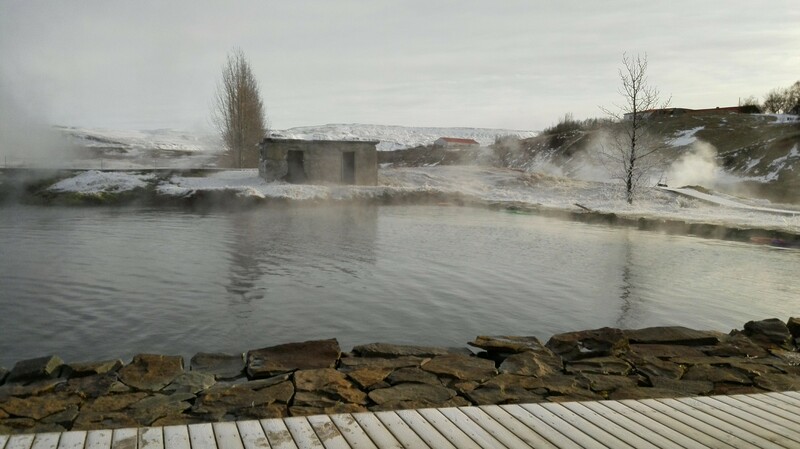 Gateway to Iceland offers this tour in combination with a visit to the Secret Lagoon, a reasonably undiscovered natural hot bath. It looked like it would be great weather for this tour, so I was very excited to go. The tour guide today was Jakob. 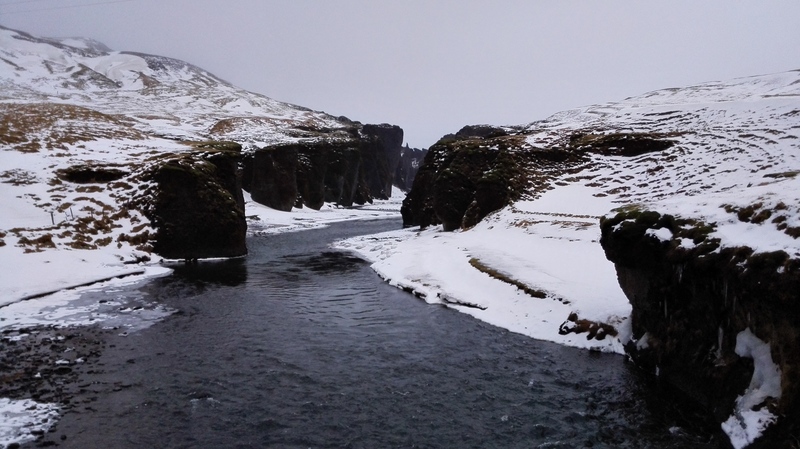 The bus was already full when I was picked up and we had a full group today with 19 people joining the tour, which is the maximum capacity for one bus with Gateway to Iceland. They were a lovely group of people; everyone was very kind and they showed they were happy to be on the tour. 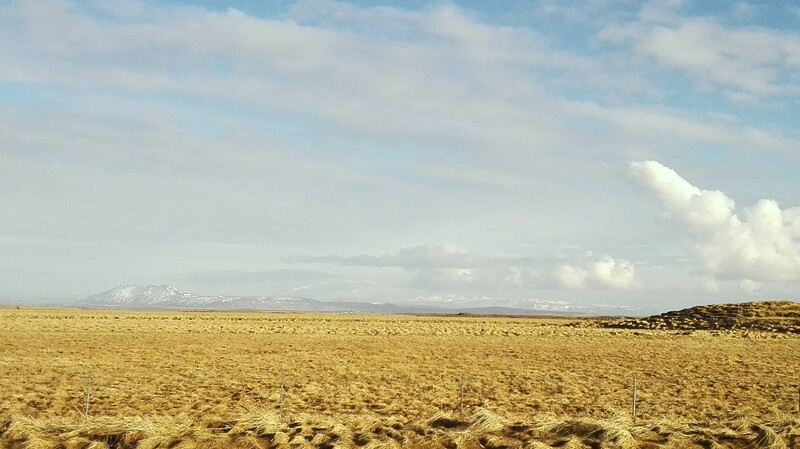 While we were driving up to the first stop, at Thingvellir National Park, Jakob started the day off by telling us stories about the landscape we were driving through. 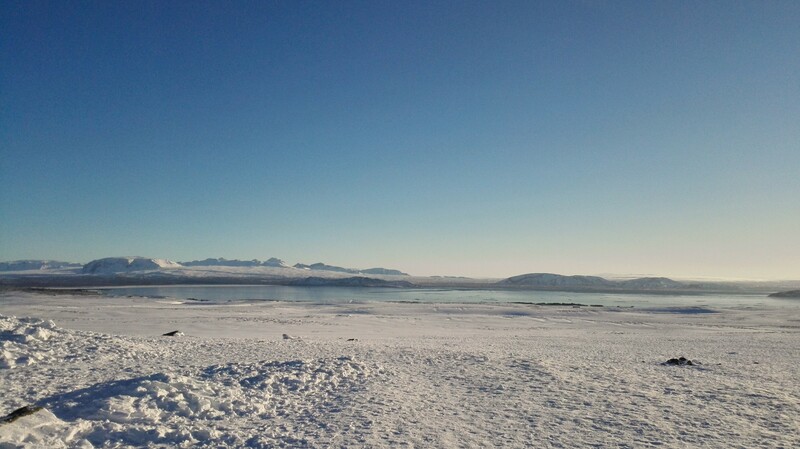 As we got closer to Thingvellir, we could see the lake Thingvallavatn coming up ahead of us, and with the sunny weather, this was quite a beautiful sight. Thus Jakob pulled over to give us some time to take pictures. Once we got out of the bus, we noticed that despite the sunny weather it was quite cold outside, so we took our photos and then rushed back on the coach. 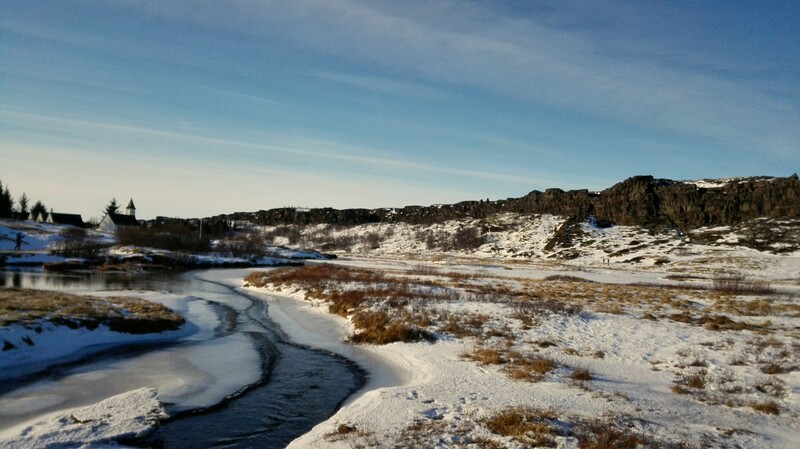 After this short stop, we went straight to Thingvellir. Once we got there, Jakob told us to go to the information center first: there he would explain the landscape to us, with the help of a model of the area. He gave a great description of the landscape, its geology, and how it had become the way it is now. After he was done he took us to the lookout next to the information center. It was quite busy here, however, Jakob had soon found a spot where the whole group would still have a great view and everyone would be able to hear him. 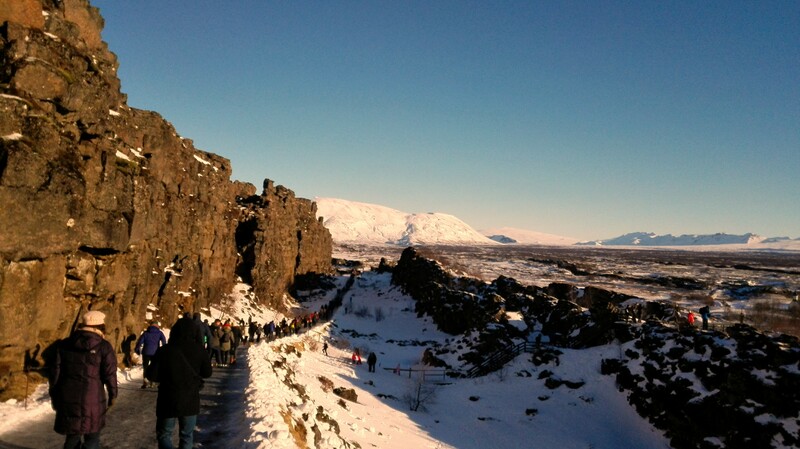 The view of the ridge between the North American and the Eurasian plate from this point was amazing. When Jakob was done with his story he asked us if we would like to take a walk through the National Park and, with the gorgeous weather, no-one could say no. He told us which path to take and that he would be waiting at the parking lot at the end of that path. 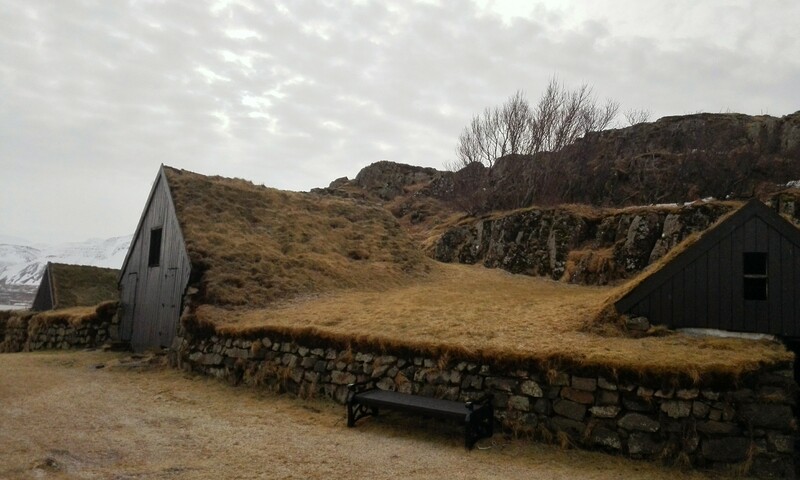 It was wonderful to walk between the ridge, and later on right by the place where the assemblies of the Althing were held, from 930 until 1798. When we met with Jakob at the parking lot he told us more about these assemblies and their importance in Icelandic history. 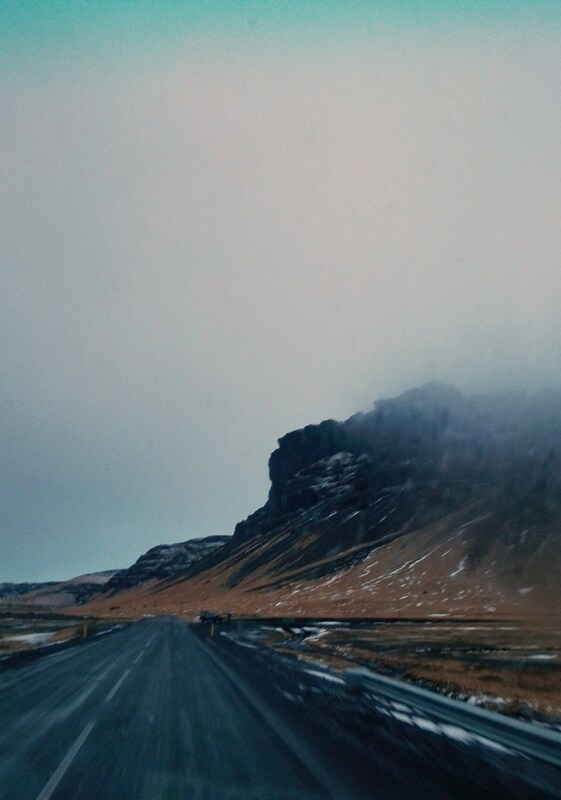 While driving away, Jakob simply continued his stories, adding more folklore to them. We were on our way to the next stop and Jakob let us decide which it would be. 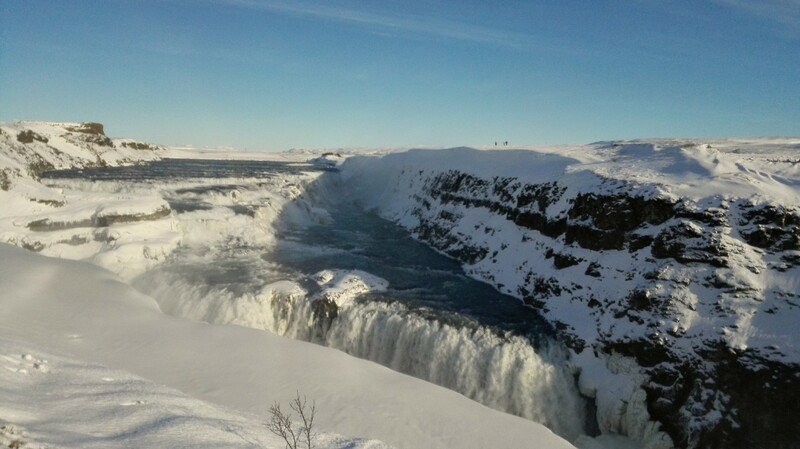 Either we would stop at a restaurant along the way to have lunch or we would go to the Gullfoss waterfall and have lunch at the restaurant there. We chose the latter and continued our way while Jakob filled the whole bus with his stories. While driving along, we came across another beautiful spot to take pictures so Jakob pulled over and let us off the bus again. 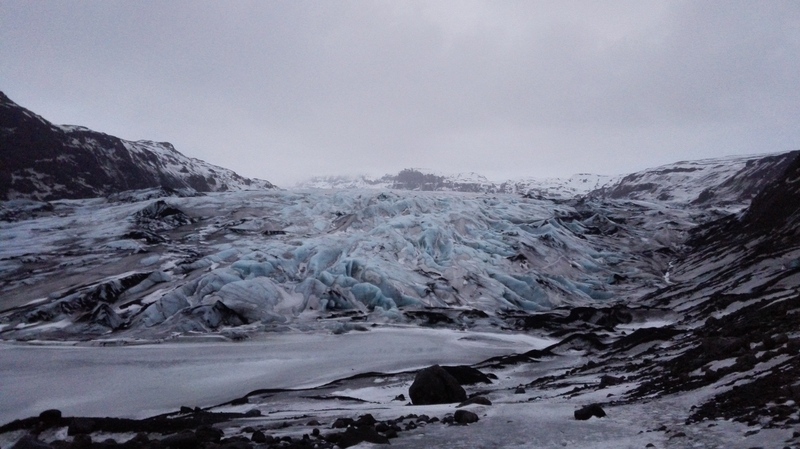 When we continued, Jakob continued his stories, teaching us even how to pronounce Eyjafjallajökull correctly. 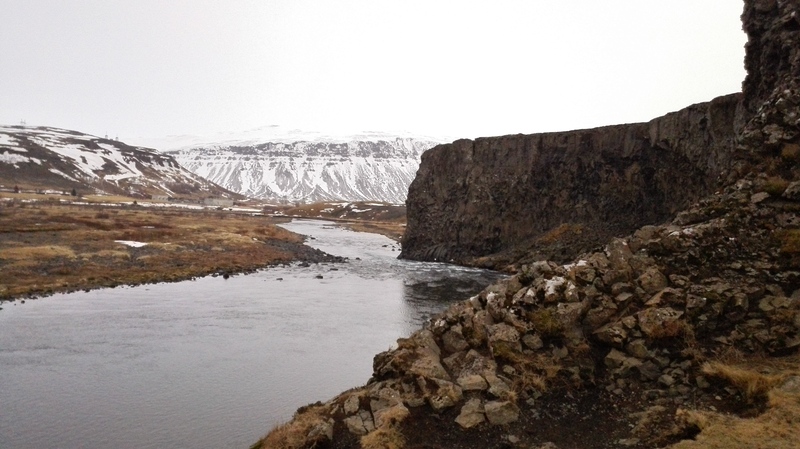 When we arrived at the Gullfoss, the waterfall itself could not be seen yet. Jakob advised us to have lunch first, and then climb down the stairs towards the waterfall, where he would pick us up at another parking lot again. So, after lunch, he left to drive the bus to the next meeting point and I climbed down to the impressive view of the immense Gullfoss. What a beautiful sight to behold! When I reached the lowest step and walked towards the edge of the viewing point Jakob walked over to me, and some of the others on the tour, to point out the sign in memory of Sigriður Tómasdóttir, a woman who had saved this waterfall from foreign investors, wanting to use this waterfall for the production of electricity. 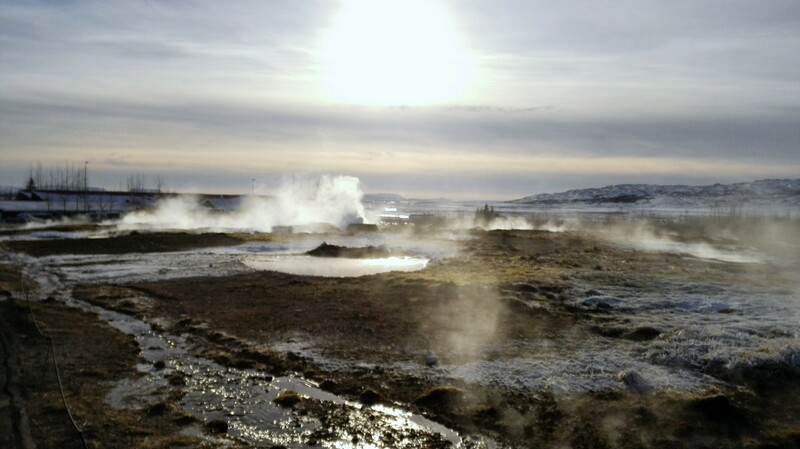 After this wonderful view, we continued to the Geysir, or as Jakob called him the godfather of all Geysers, for giving them their names, since the Geysir, was in fact, the earliest geyser known to Europeans. 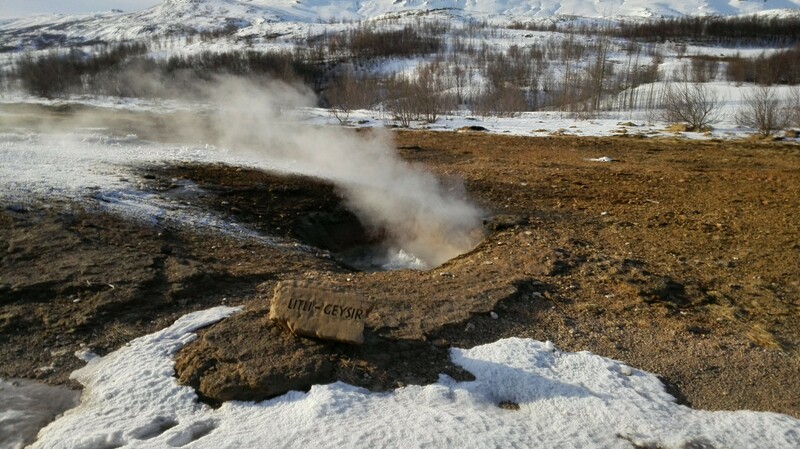 Now Geysir does not erupt regularly anymore, however, the nearby geyser Strokkur still erupts every few minutes, which offers a great sight. When we arrived I first went to take a look at Geysir and it looked quite impressive. After that I joined the people standing around Strokkur, waiting for him to erupt. It was great to see that geyser spout its hot water up in the air and leaving an enormous white cloud with every eruption. So I stayed to watch him erupt three times. 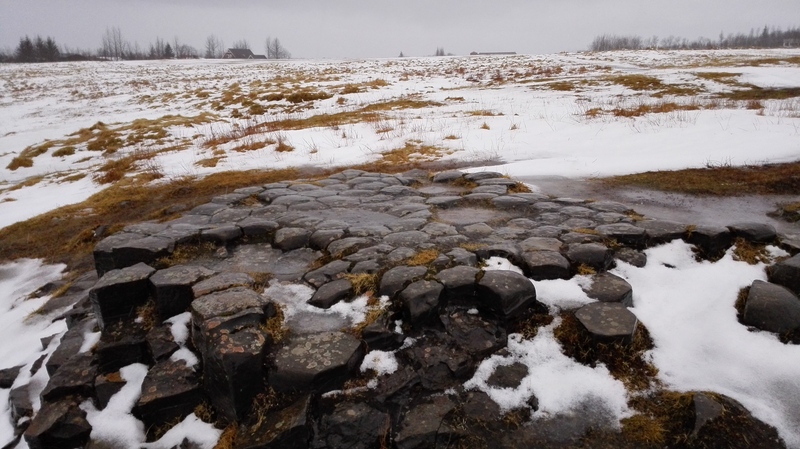 I continued the path, leaving Strokkur behind, to walk towards the next meeting point. 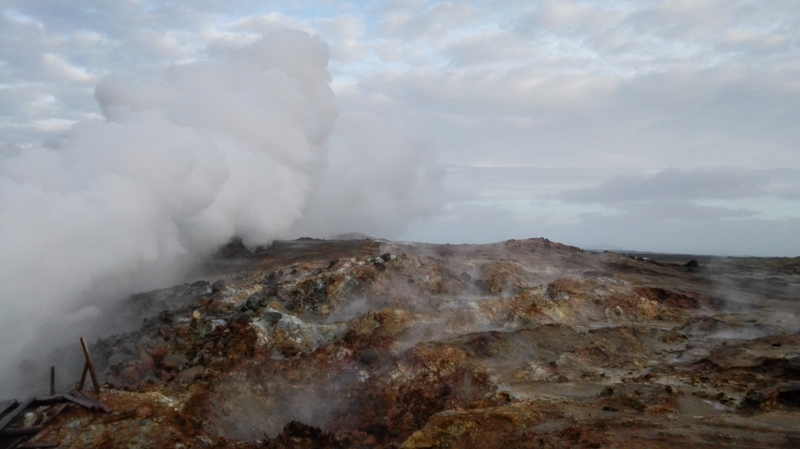 Along the paths, the geothermal activity below the ground offered a spectacular variety to the landscape at this site. 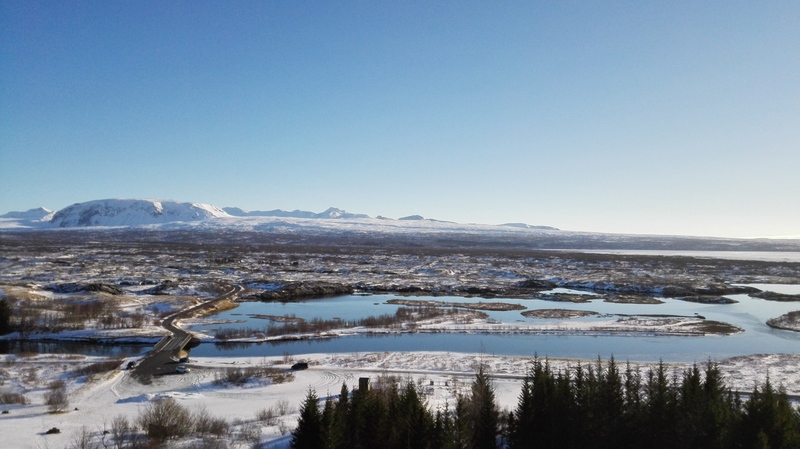 After leaving Geysir, we would only have one stop left – the Secret Lagoon. However, Jakob provided a pleasant surprise. 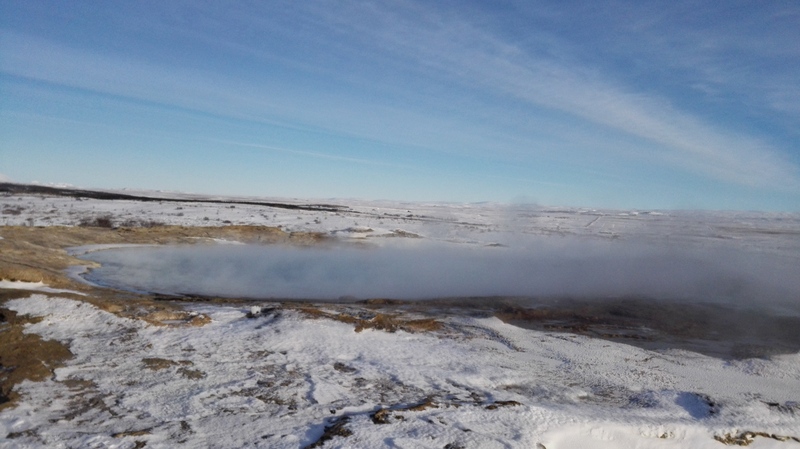 Just a short while after we had left Geysir, he told us we were going to visit some friends, but that we would need to persuade those friends to come close to us. 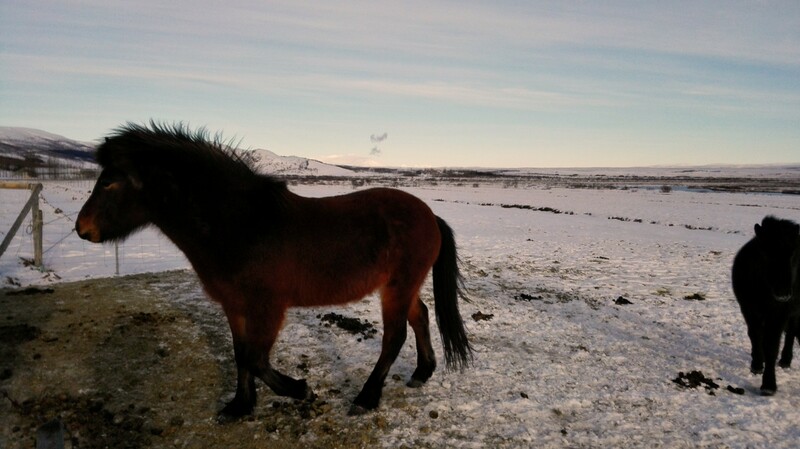 As he said this he pulled out a big bag of bread and gestured towards a group of Icelandic horses. As soon as they noticed us they came running towards us, allowing us to pet, take pictures and most importantly, to feed them. After saying goodbye to our new friends, we continued to the Secret Lagoon. As soon as we arrived its name became very clear. There were barely any people there, which provided us with all the space we could want. Throughout the day the temperatures had been quite cold, therefore it was even more satisfying to get in the hot pool, which was around 40° Celsius that day. When we had completely warmed up again, everyone went back inside and, as soon as everyone was ready to go, we left for Reykjavik. Having finally done this tour today, I can tell why it is so popular. 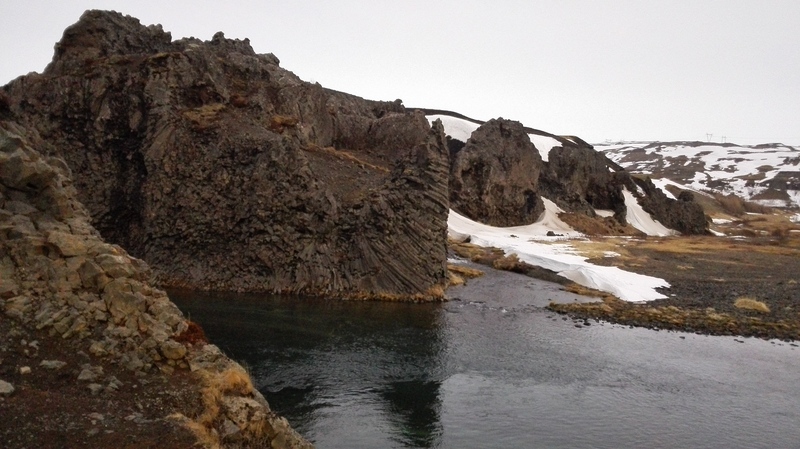 It combines some of the most beautiful and most historic parts of Iceland with complete relaxation. Jakob was a wonderful guide, it’s clear why he is one of the best guides with the company. All the way, throughout the tour, he was able to keep talking the whole time, and every bit of every story seemed like the most interesting thing I had ever heard. 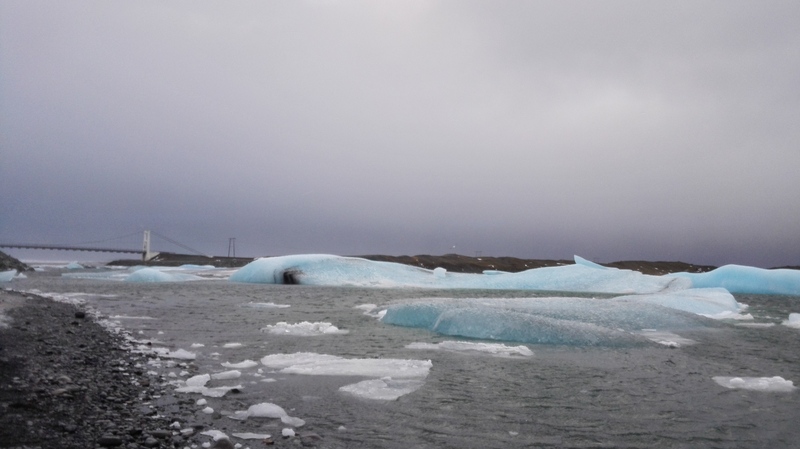 On Wednesday I finally went on the Glacier Lagoon tour, I had already heard quite some positive things about this tour, which made me really excited to go. Ian would be the driver/guide again for today, so I knew that today’s tour would be fun. After Ian picked me up, at 8 AM, we could immediately leave Reykjavik, because I was the last to be picked up. The group for this tour was again a bit larger, with 18 persons including myself, and they turned out to be enjoyable company. We had a rather long drive ahead of us since the tour does not offer sightseeing stops until Vik, this is because all the possible stops on the way to Vik are featured in the South Coast Tour (read: Amazed by the South Coast). Though we did stop along the way a few times for coffee breaks, and by the way, Ian was filling the tour bus with stories, the time simply flew by. Ian told stories about the Icelandic culture, and also briefly explained some geological attractions we could see from the coach. 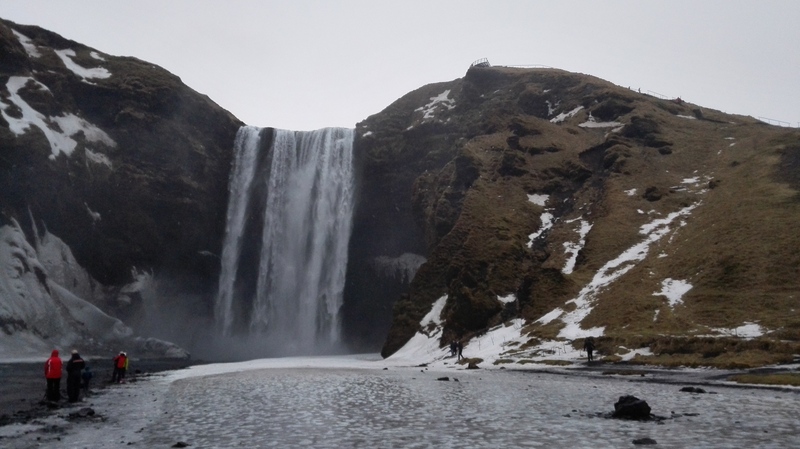 Whenever someone asked a question about anything related to the Icelandic culture or the sights we could see along the way, Ian would take his time to answer these questions the best way he could. 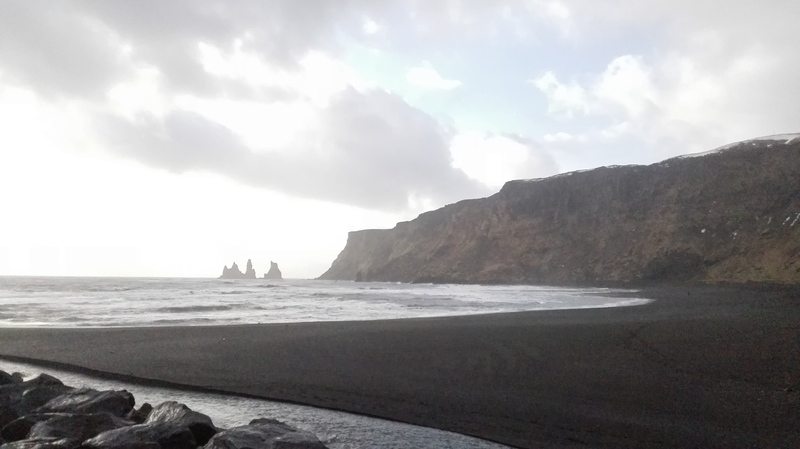 When we arrived in Vik we had another coffee break, and we were allowed some time to walk around and see the beach we also visited on the South Coast Tour (read: Amazed by the South Coast). 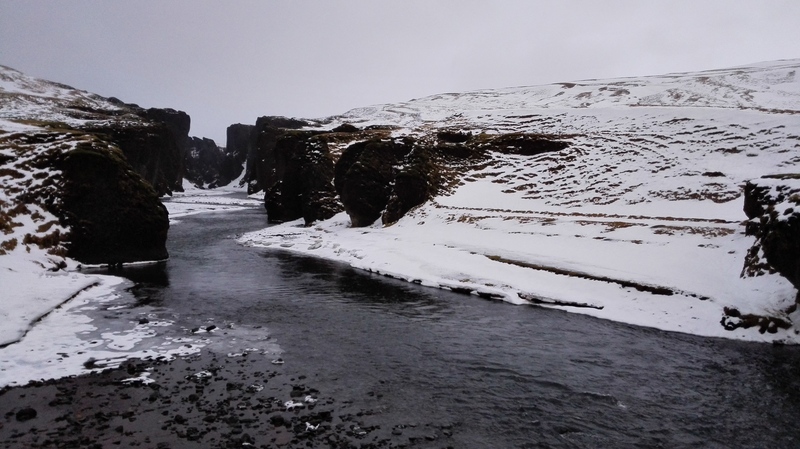 After our stop in Vik, we continued to the first official tour stop, the Fjadrargljufur canyon. At f,irst Ian told us he was not sure if we could get there, because we would need to turn back if the road that led there was too icy. Though to us the road conditions seemed rather bad, it was barely a challenge for Ian. When we arrived at the site Ian told us to walk down to the bridge, and to look to our right side for a view of the canyon. It was a wonderful view, and a great way to start the tour. After we had spent a small amount of time admiring the canyon, we headed back down the road, to the highway, on our way to our next stop, the Kirkjugólf, or the Church’s floor. Here we could see a natural phenomena of basalt pillars, which were most likely eroded by the sea over time, and now look like a man-made tile (church) floor, to which it owes its name. A piece of the Church’s floor. From here we left for a small restaurant further along the way, where we were given an hour to eat lunch. After this we continued the journey to the Glacier Lagoon. Again this took quite some time, yet Ian kept us entertained, and the view was becoming more and more stunning as we drove on over the lava fields of the Laki eruption in 1783. 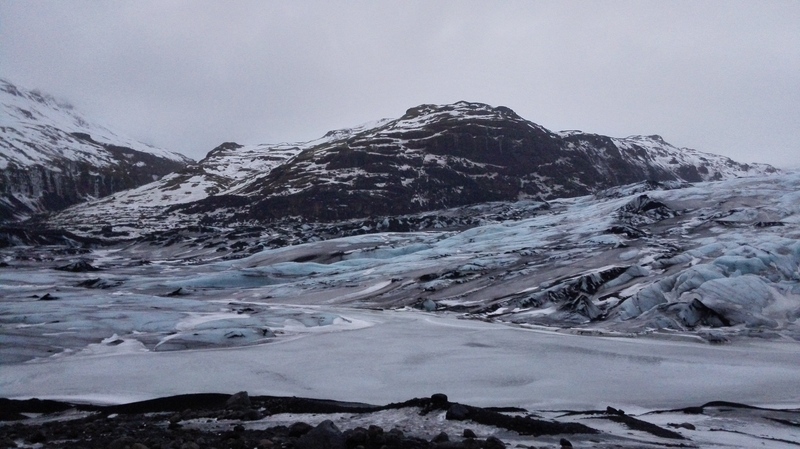 About half an hour before arriving at our destination we could already see other Glacier tongues of the Vatnajökull. 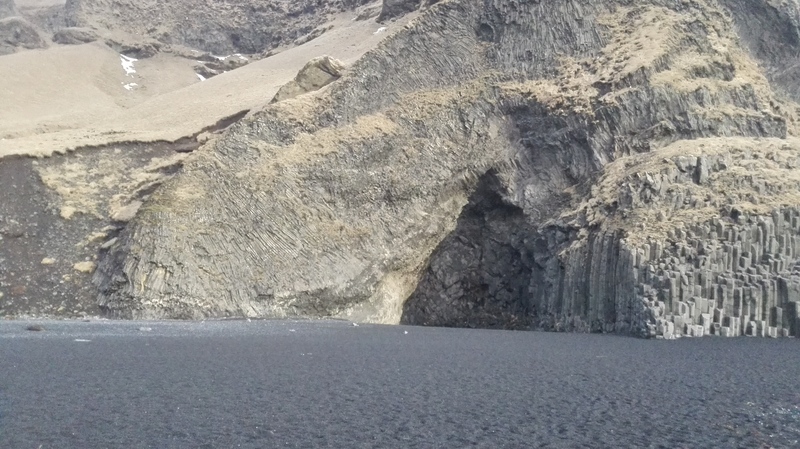 One of the Glacier Tongues, which could be seen on the way to the Glacier Lagoon. 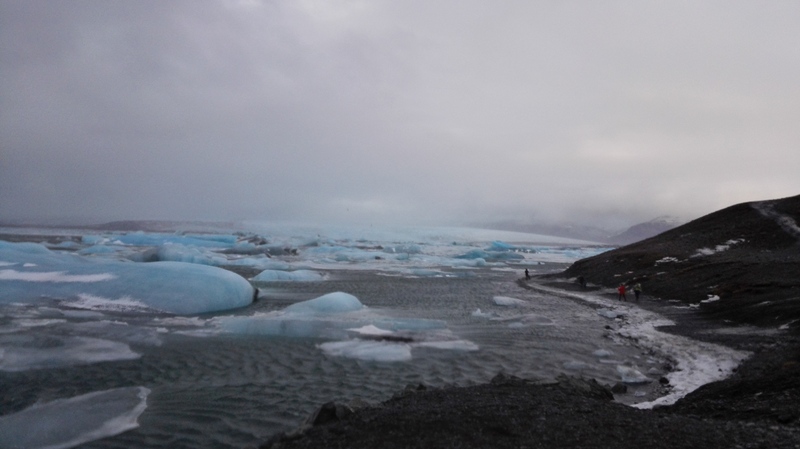 Before arriving at the Jðkulsárlón Glacier Lagoon, we needed to cross a bridge over the opening between the Lagoon and the Ocean, and Ian told us that we wouldn’t be able to see the lagoon until we had reached the bridge. 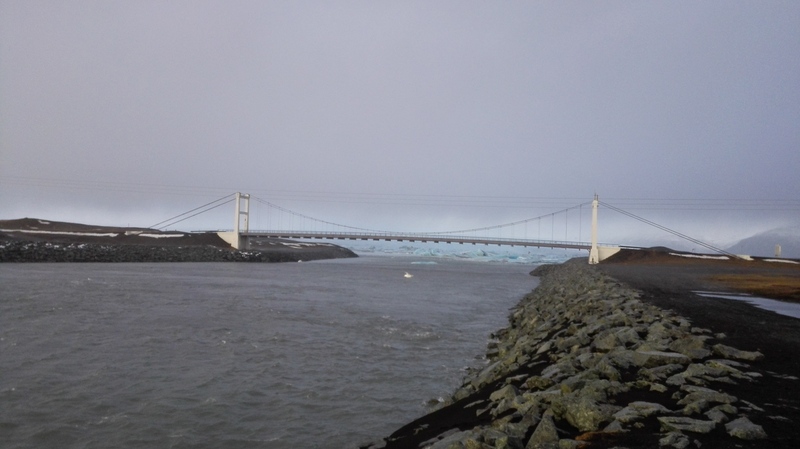 Once we started crossing the bridge, we had a stunning view of the Glacier lagoon, and several Icebergs attempting to ‘escape’ towards the ocean, and everyone became anxious to step out of the tour bus, and explore this beautiful site. 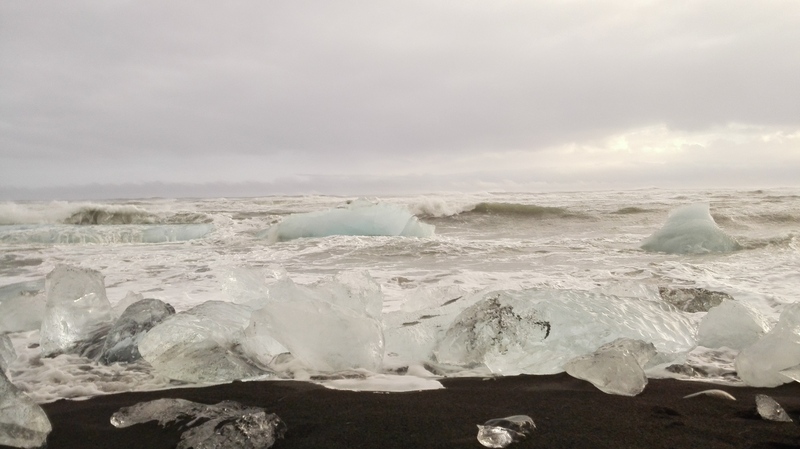 We would have half an hour to walk along the shore of the Lagoon, and then Ian would take us to the other side, to the beach where some of the icebergs that had succeeded in escaping to open waters were washed ashore. 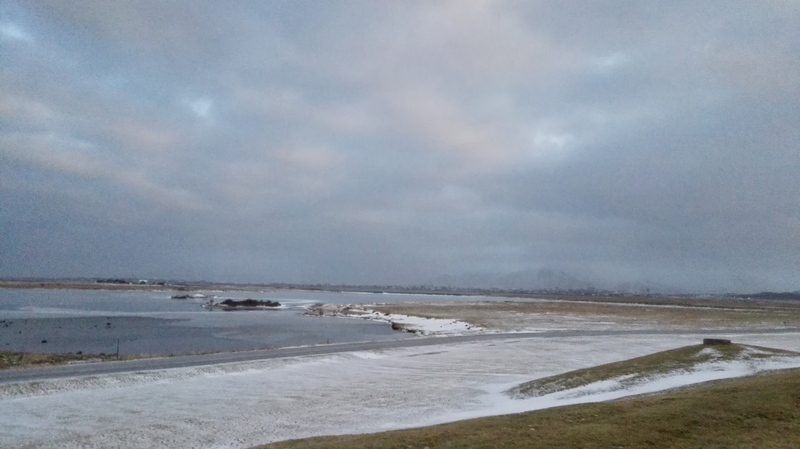 There was a very sharp Icy wind blowing, and the raindrops felt like ice when I walked by the Lagoon, but the view was so spectacular I hardly noticed how cold it had been until I returned to the coach. When everyone who wanted to see the beach had returned to the tour bus, Ian drove us across the road, to the shore. 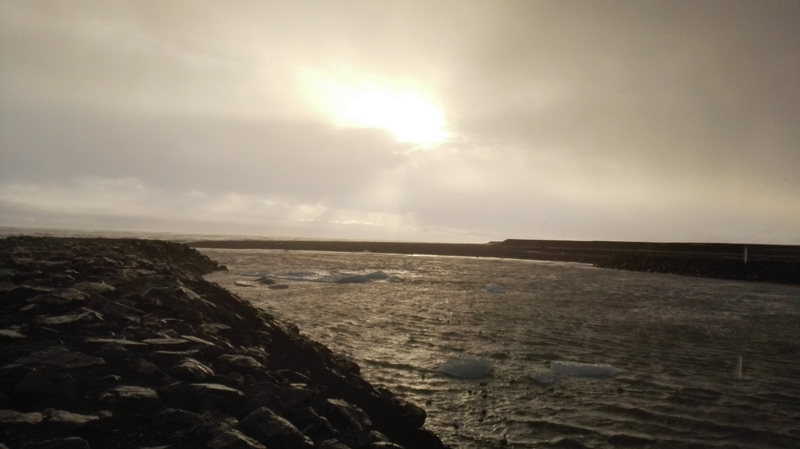 Here we were granted a beautiful view of the Icebergs laying on the shore, with the waves crashing into them, as the sun started to come out. i walked back and forth along the shoreline for a while and then I decided to walk to the opening between the lagoon and the Ocean, where I could look just beyond the bridge, and see the sunlight hit the Glacier Tongue, which was only barely visible when we were at the lagoon because of the cloudy weather. It a was beautiful sight, yet very difficult to capture on camera. After spending another half hour at the beach, Ian drove us back to the lagoon, to pick up the other people, who had stayed there. When everyone was back on board, we drove back towards Reykjavik. 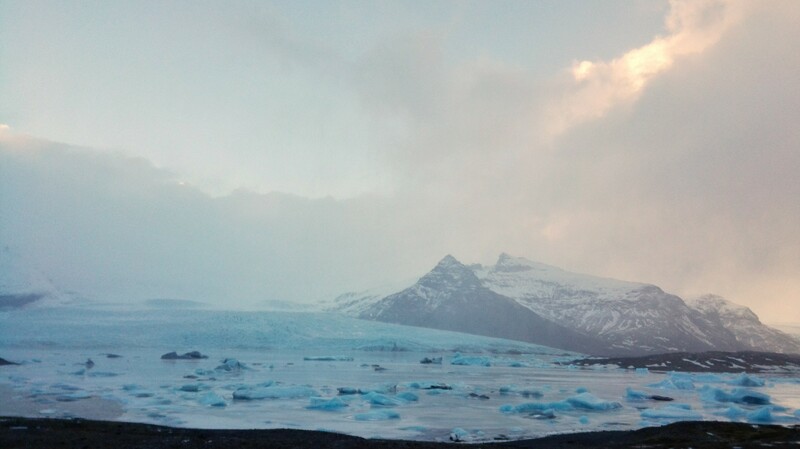 In a few minutes after leaving the Glacier Lagoon, one of the other Glacier Tongues could be seen again, while the sunlight hit it this time. 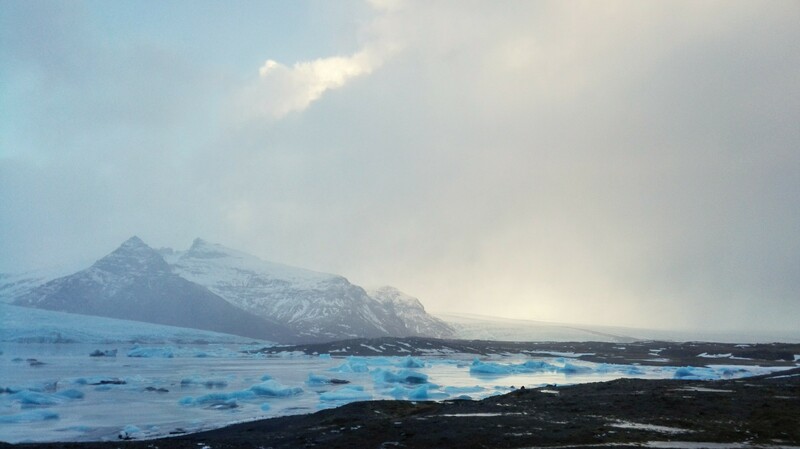 Noticing that people had started to photograph this sight, Ian made a turn towards this Glacier Tongue, where we had a view of another stunning Glacier Lagoon, though smaller, and not connected to the Ocean, like the Jökulsárlón. Then we turned back to the Highway and continued our way back, where we would have one more stop before it would be too dark to see anything. 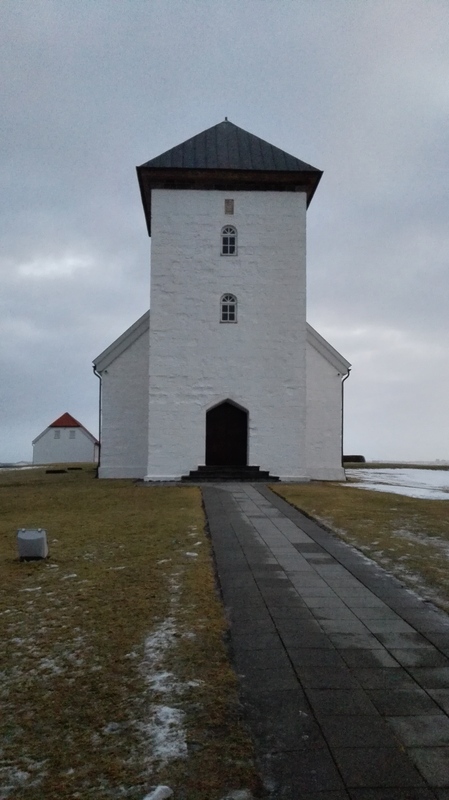 Ian drove us to the church of Hof in Öræfi, where he told us that this was the last turf Church to be built in Iceland. Leaving this final sight, it was time to return to Reykjavik, where we would arrive just after 10 PM, only stopping to get dinner and some rest stops on the way. Though while driving back, just before it got dark, Ian pointed out one last point of interest, the face of a troll, turned to stone by the sunlight, right in front of us. I truly loved this tour, though it was a long day it was certainly worth it. I cannot wait until I can do this tour again in the summer, when there will be a chance to take a boat ride across the Lagoon as well. 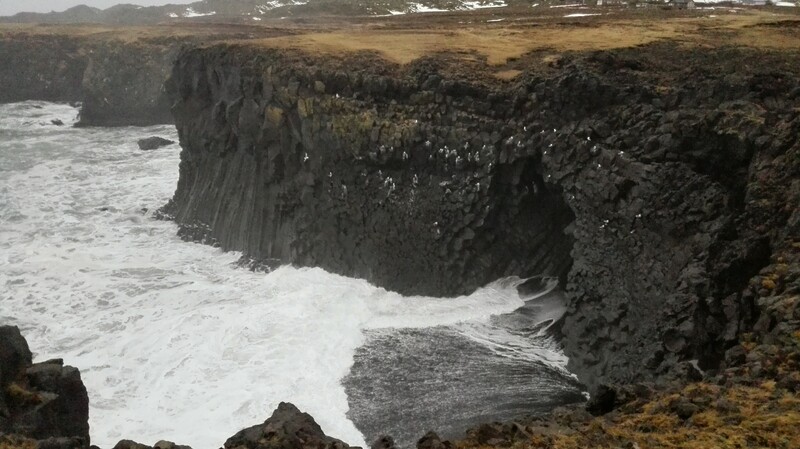 The troll’s face can be seen on the edge of the rocks here. It was time for me to go on yet another tour, this time I would be discovering the Southern Coast of this beautiful country, together with driver/guide and funny guy, Ian. The day before I wasn’t completely sure about going on the tour because the weather wasn’t looking very good. However, when Ian came by at the office, he told me I should go on the tour, because I should experience it in any type of weather, and I am glad I listened to him. Ian picked me up at my B&B, and from there we did the rest of the pickup. This time the group was quite a bit larger than the last tour I went on, with 13 people, including myself. After a few brief stops in the city, we were off to the South. It took quite a long time to get to the first stop, but Ian kept us entertained along the way. He told us interesting facts about things we sadly could not see for ourselves, due to the fog. Still the way Ian told us it didn’t really matter that we couldn’t see them, it was interesting enough either way. 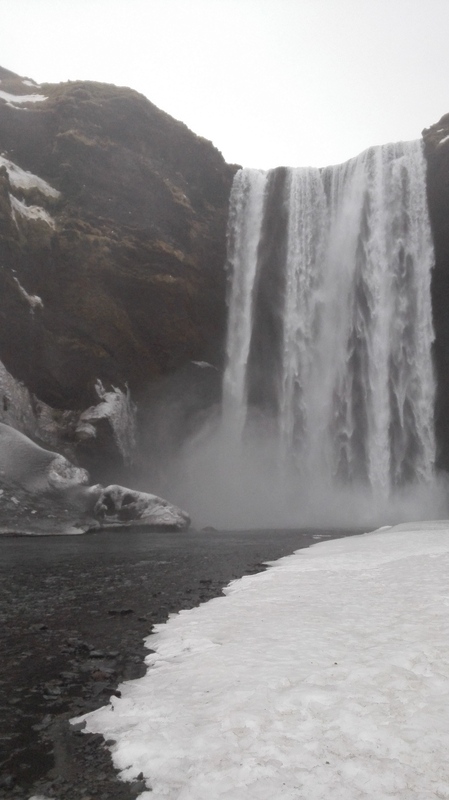 We reached our first destination while the fog was clearing, the Seljalandsfoss waterfall. The scenery here was absolutely amazing, and even though the sky was cloudy and it had still not stopped drizzling, I did not mind getting out of the bus to discover the sight. At this sight there is actually one large waterfall, and two additional smaller waterfalls, which are equally beautiful to watch. 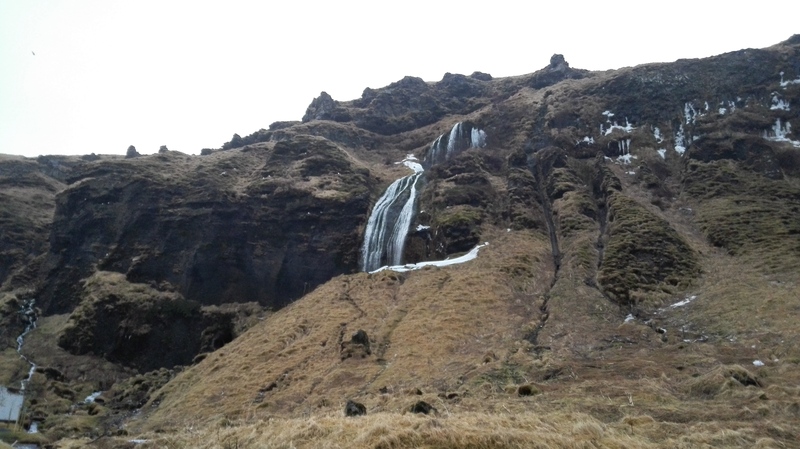 After walking around here for about 20 minutes, we went on to our next stop, the second waterfall: the Skogafoss. This waterfall was even more amazing than the first, and even though the path towards the waterfall was covered in very slippery ice, it was well worth getting closer. With this waterfall you can simply go as close to it as you dare, and for this I really regretted not wearing a rain coat, because daring to get close is one thing, but I did not intend on getting soaking wet, and then having to spend the rest of the day on the tour bus in damp clothes. So I stayed at a safe and reasonably dry distance. This is the closest I dared to go, without getting wet. While walking around a bit more, I saw some stairs leading up to a viewing point above the waterfall. With only a few minutes left before we were supposed to return to the bus, I started climbing the stairs. This proved to be a bit more time consuming than I had anticipated, because the stairs were much steeper and longer than I had thought. when I reached the top, completely out of breath, it turned out to be a wise decision to go up, because the view was stunning. After taking a few pictures, I ran back down as quickly as I could without falling, and made it back to the bus in time, even though Ian told me it would have been no problem if I had taken a bit longer. The view from the lookout over the waterfall. While we drove away from the Skogafoss waterfall, Ian gave us a choice, we would either visit all the sight on the tour first, and then have lunch in Vik, after which we would simply drive from Vik straight to Reykjavik, or we would first go to Vik, and have lunch there, after which we would visit the remaining sights on our way back. Since it was already quite late, we chose the latter. And I was happy we did, because by the time we got there, I was shaking with exertion from climbing those stairs earlier. At the restaurant in Vik we could choose for ourselves what we would order, and I decided to finally try the traditional lamb soup. The soup was quite expensive, at approximately 1,800 ISK, but it tasted good, it was richly filled, the bowl was literally filled to the brim, and we got some bread and butter with it as well. While we were eating Ian explained that with the soup it would be okay to go for seconds, because it is included in the price. However after eating one bowl of the rich soup, I couldn’t eat another bite. 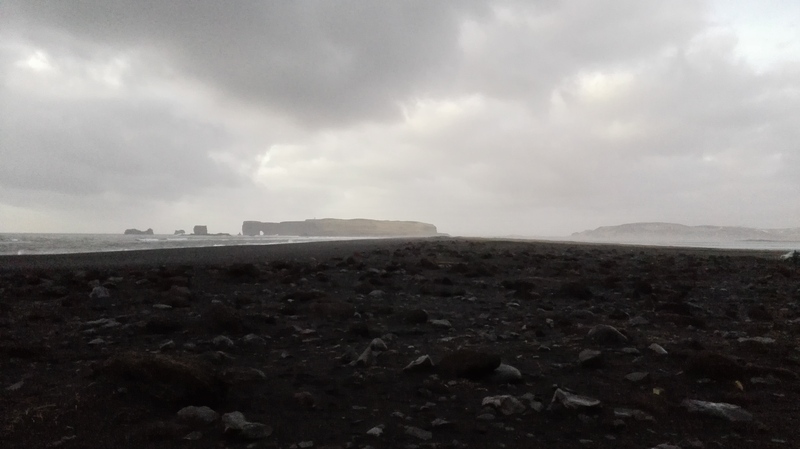 When I had finished eating, there was still some time left, so I decided to take a look outside, at the black beach of Vik, which has a stunning formation of rocks. These rocks, Ian explained, are not really rocks according to Icelandic folklore, but trolls who got caught by the sunlight, while trying to tow in a ship, and they and the ship then turned to stone. The three rocks sticking out of the water here, are the trolls and the ship, which turned to stone in the sunlight. 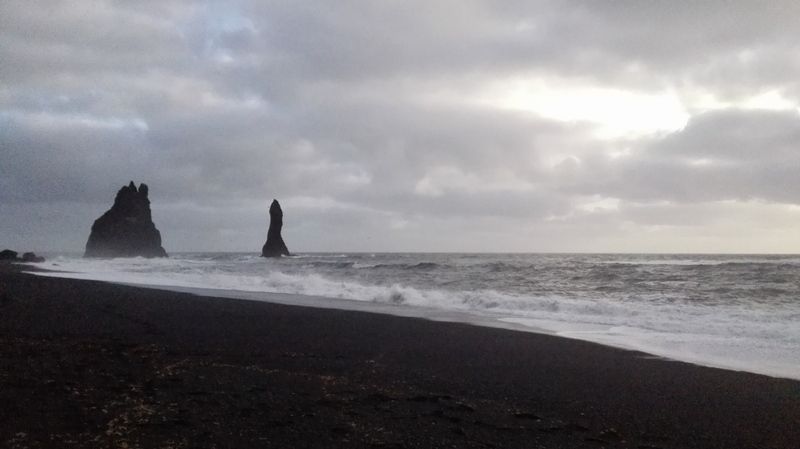 After this one hour break, we continued to our next destination, the Reynisfjara shore. 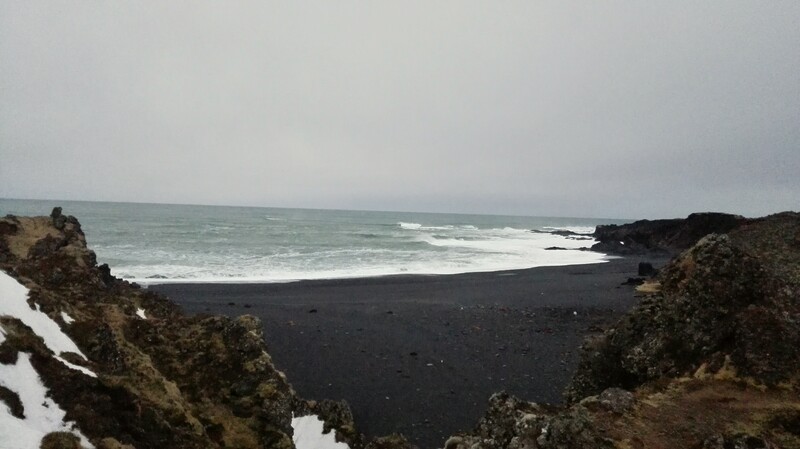 This place is a truly beautiful black sand beach, with some wonderful rock formations on the coast. It was wonderful to walk around here and look at the amazing rocks on one side and the waves on the other side. Ian had warned us before getting off the bus, that we should be careful around the shoreline here, because the waves here are treacherous, and can easily take unsuspecting victims into the ocean. While watching the waves this proved to be true, the waves reached further than one would suspect, and with all the people standing with their backs to the waves to take pictures of the rocks, it’s no wonder accidents happen here. While we walked around the individually, Ian walked up to everyone who was with us on the tour to give them some very interesting information about the rock formation, and how come they were shaped the way they are. Back on the bus it was time to go to our final stop of the tour, the Sollheimajðkull Glacier. Once we got there we could not see anything yet, and Ian told us to take a path that would lead to a viewing point of the glacier, and that he would meet us there. 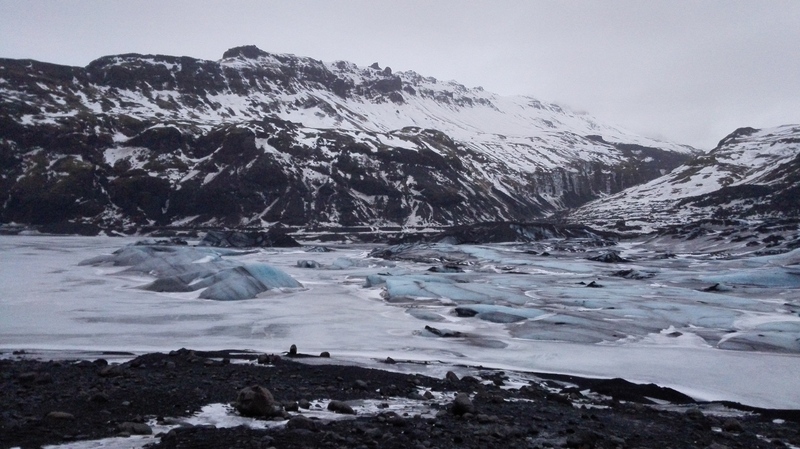 As soon as we could see the glacier, I could not wait to get nearer, It was absolutely stunning, with pieces of clear blue ice sticking out, combined with gray and black rocks, and still some ash from the Eyjafjallajðkull eruption. while we were taking pictures of this wonderful sight, Ian joined us to give us some more information. 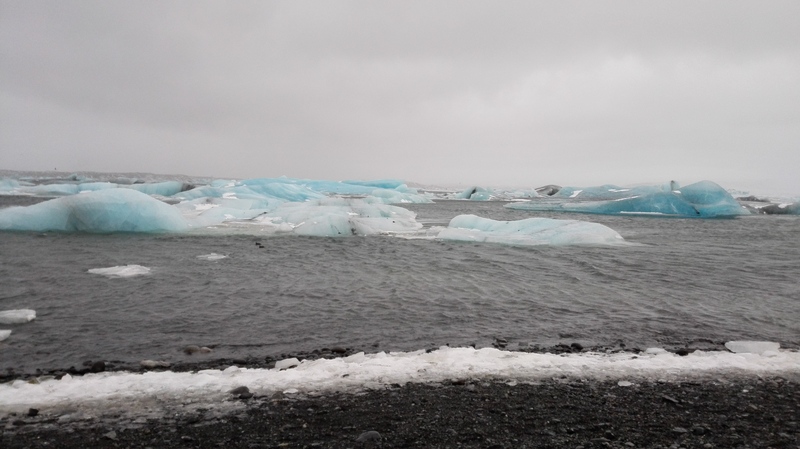 He told us that it would seem particularly hard to capture the blue color of the ice in a picture, and it actually was, though I think in the end, I did manage to get it quite right. 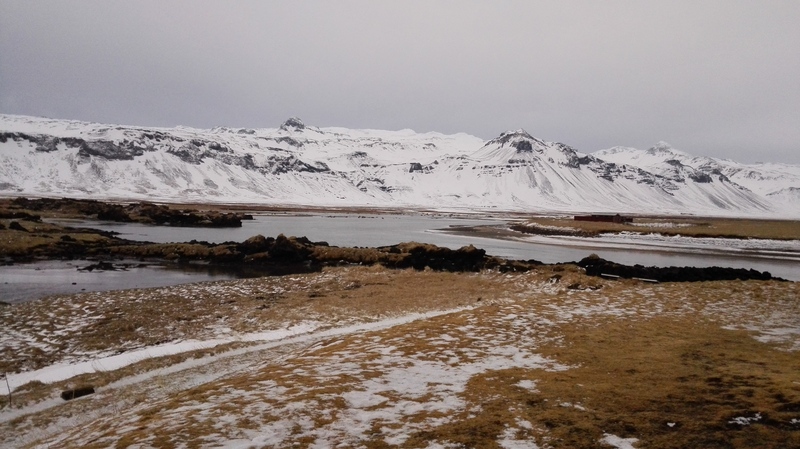 Ian told us that the glacier is retreating, he said that when he first visited Iceland approximately 15 years ago, the glacier came up to the ridge between the mountains, which is visible in this picture. Me in front of the glacier! 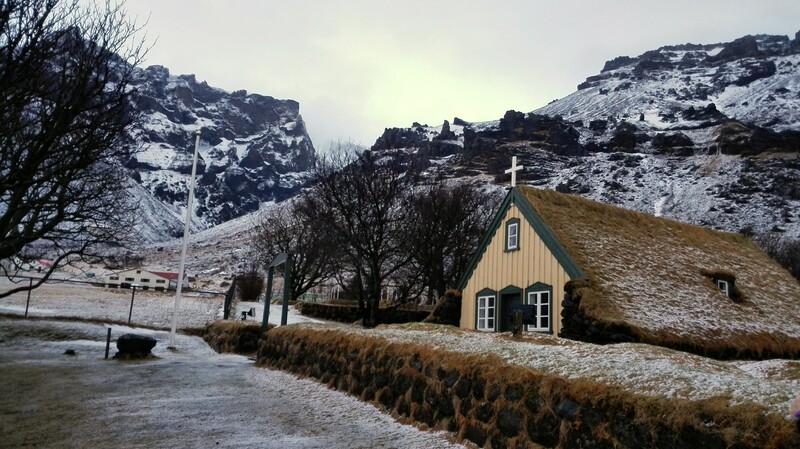 It was my first day tour with Gateway to Iceland ! 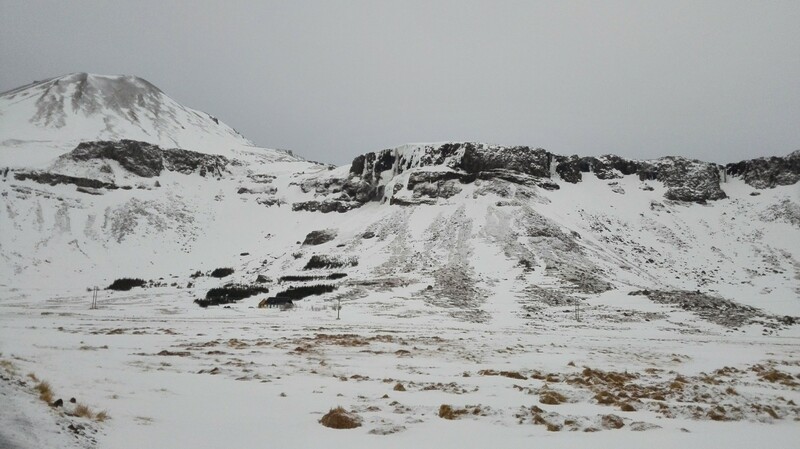 Initially I was supposed to be going on a tour to the Snæfellsness national park and its surroundings, but because the snow started melting, and then freezing again, the roads up to Snæfellsness had become too icy. 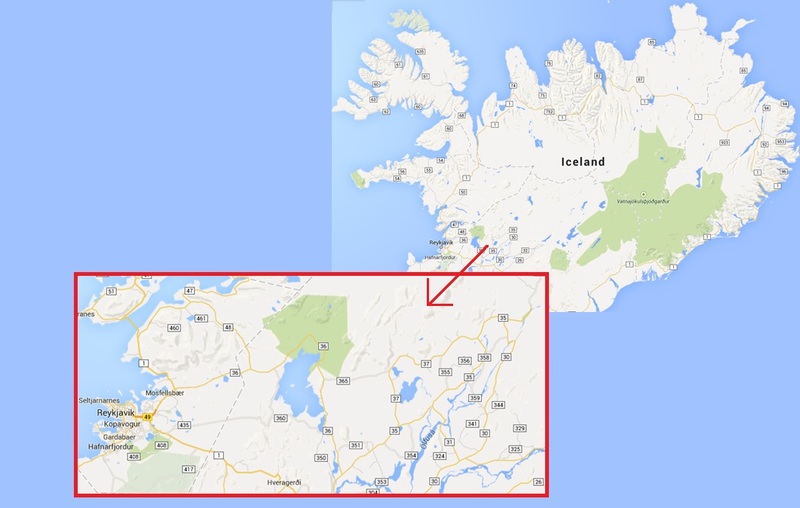 However Gateway to Iceland came up with a great solution, there would still be a tour, only instead of going to Snæfellsness, we would be touring the Reykjanes area, to the south-west of Reykjavik. Still due to the bad weather this tour had to be slightly adjusted, this means that not everything I mention in this blog post is part of the official Reykjanes tour. 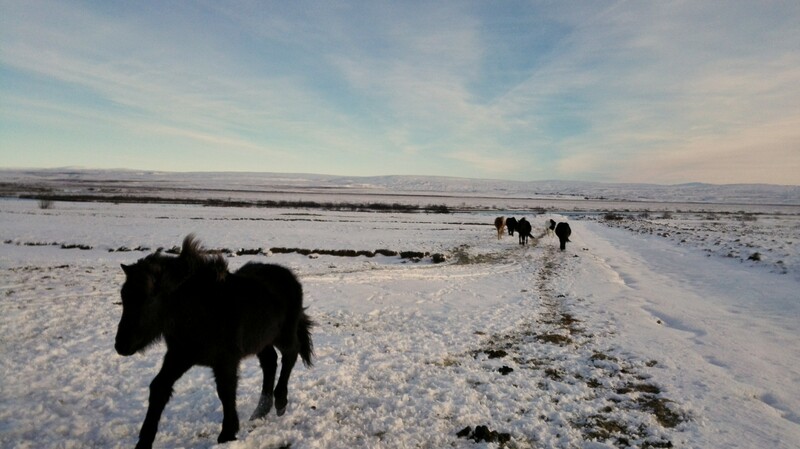 The tour was guided by Gummi, who is the president of Gateway to iceland. I was picked up at the B&B where I am staying, BB44, and we started driving to the south. Along on the tour were a friendly couple from Dennmark, and three people from the USA, so a very small group. 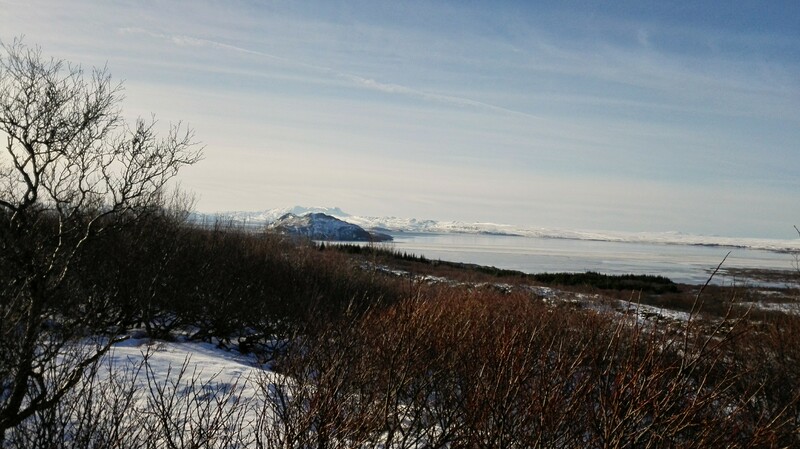 First we made a small detour to Alftanes, which is where the president of Iceland lives, and Gummi drove us up to the church in front of the president’s residence, where we got out, and got the chance to take some pictures, of the beautiful view we had from there. The church in front of the president’s residence. After we left here we went on to drive through Hafnarfjordur, this town was named so for its natural fit as a harbor. While Gummi told us stories about this town, its houses, the fishing industry and the hidden peoples (elves). When we got around to the harbor we drove up to the fish market, where we were permitted to take a look inside. After taking a look at the catch of the day, we continued further to the south. 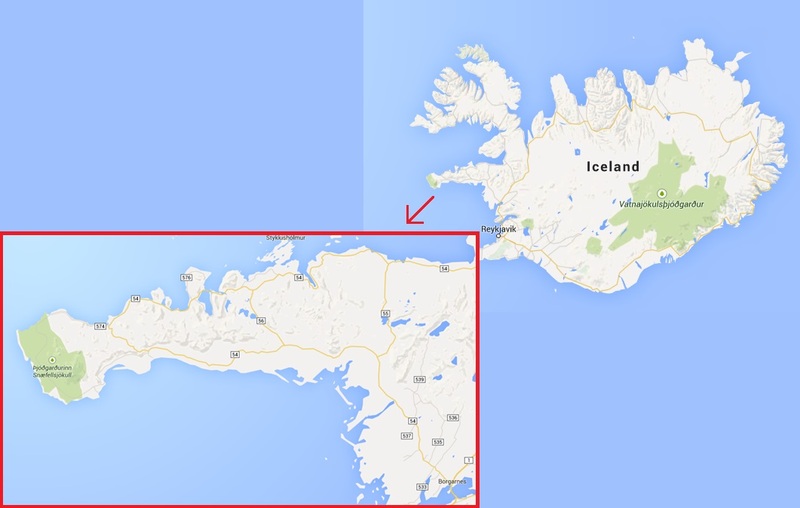 We went to Grindavik, another harbor town however with a far less natural harbor. Gummi told us about this treacherous harbor entry, which in bad weather conditions can lead a ship to get stranded. In this town we stopped for a lunch break at a small restaurant, which offered a buffet at a very small price. Gummi tells us that when he is in the area of the restaurant, he tries to have the lunch break there, because he simply loves the food and the atmosphere. 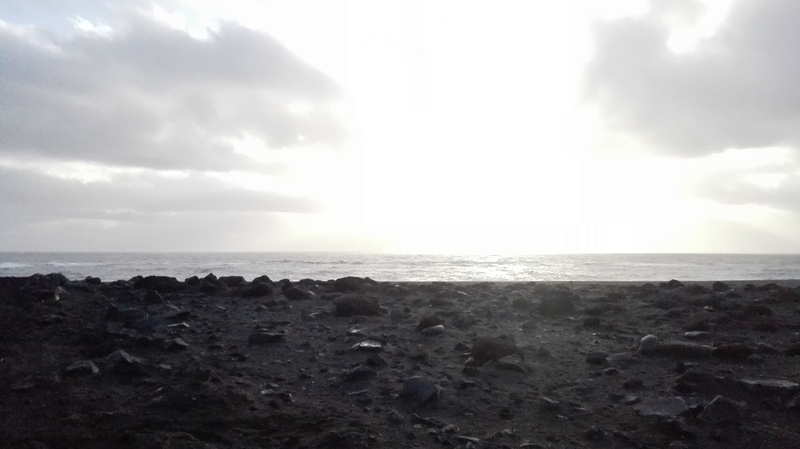 We drove on into a large lava field along the harbor, where evidence of the many stranded ships could be found. There were signs with newspaper articles about these ships, and there was still an entire ship stranded on this shore, which had been torn in half. One half of the stranded ship, approximately 200 meters from the other half. 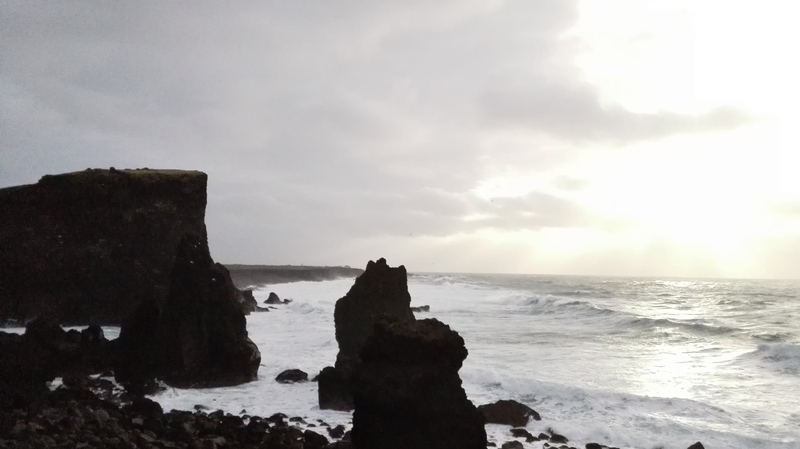 The tour continued along the coast, until we reached a point where we had a beautiful view of the North Atlantic ocean, and the Icelandic coast. There was a very strong wind here, which made it very cold to be outside of the bus, but every moment outside was worth it. You could see gigantic waves crashing into the rocks, and you could climb a small, yet steep, hill along this coast, which offered an even more breathtaking view. When I expressed to Gummi how impressed I was by the size of the waves, he told me these waves were even small compared to the true giants that usually come crashing onto the shore. I made some pictures here, but the wind made it very hard to keep my camera still, which made them a little bit blurry. Beautiful view from the top of the hill. 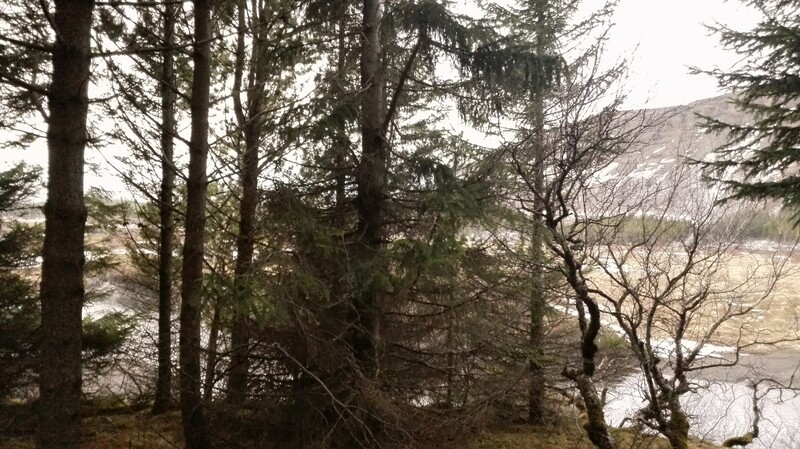 From here we continued to the Gunnuhver steaming mud pools, where Gummi told us another Folklore concerning this area. 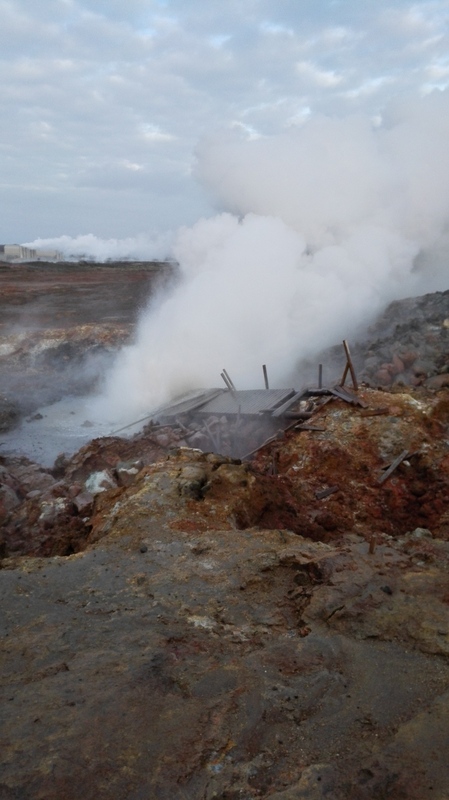 Here we could see the steam rising from the boiling ground, and we could walk through the steam of the mud pools, over an elevated path. 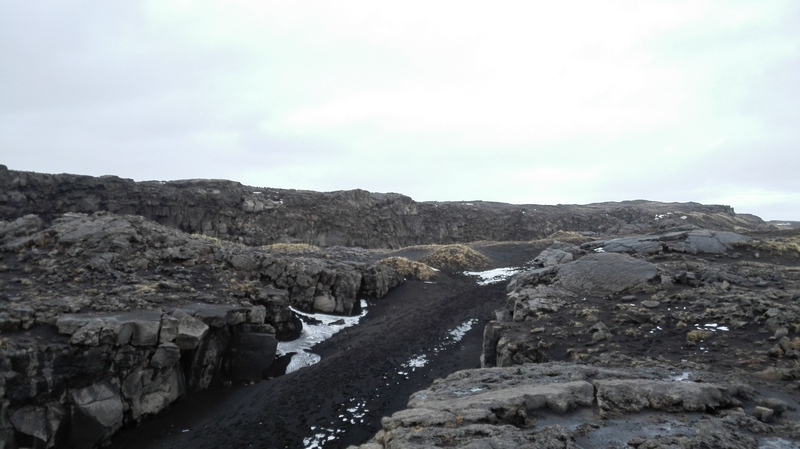 After leaving the Gunnuhver we drove over the mid Atlantic ridge, towards where the North-American plate begins. 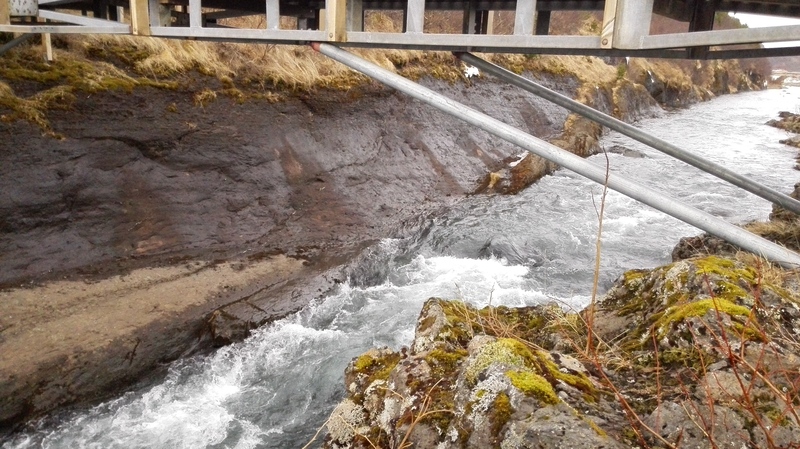 Here a small bridge was built to symbolize the crossing between the Eurasian plate and the North-American plate, though Gummi told us this is incorrect, since the Eurasian plate and the North-American plate are several miles apart. 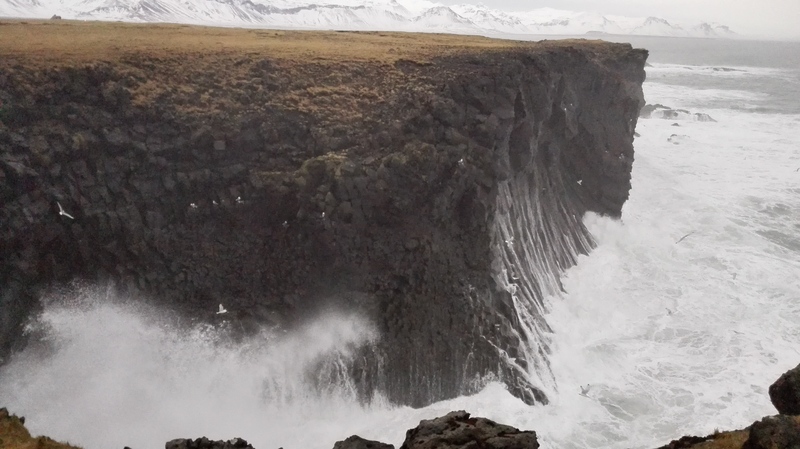 The wall you see here, is the North American plate, sticking out over the mid Atlantic ridge. 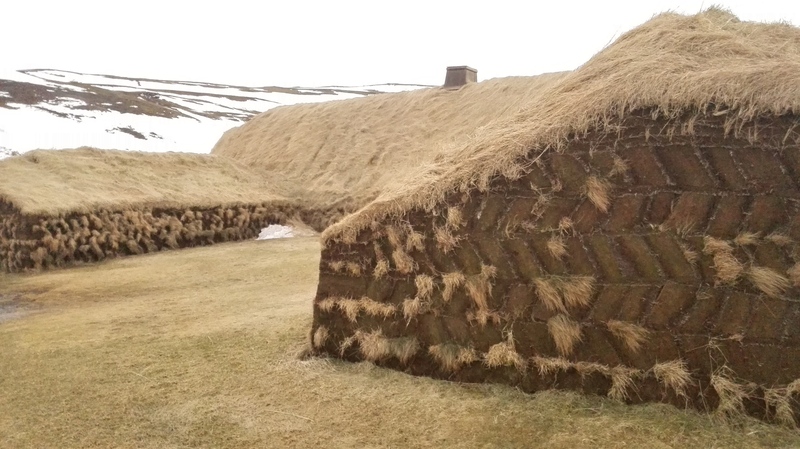 Before we would return to Reykjavik, where everyone would be dropped off at their own hotels, we made a stop at the Vikingaheima/Viking world museum in Keflavik. 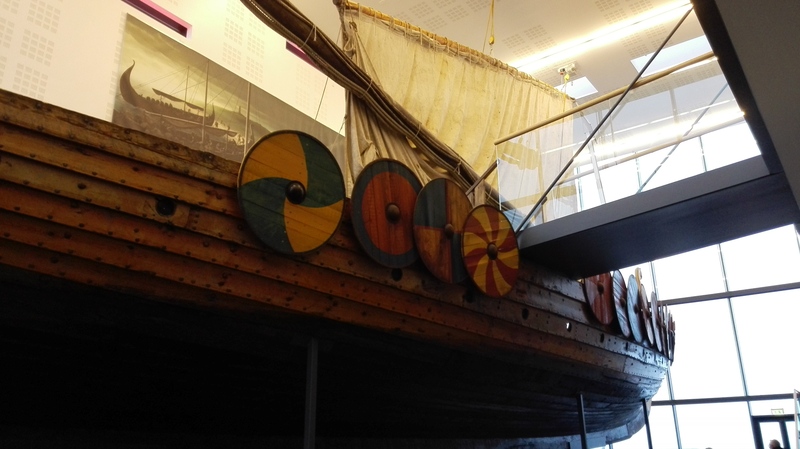 In this museum the viking ship Islendingur (the Icelander) is exhibited, this ship is an exact replica of a real ninth century viking ship, built by using the same materials and methods, that were used then. This ship was also sailed to Greenland, Newfoundland, and even New York, in 2000. 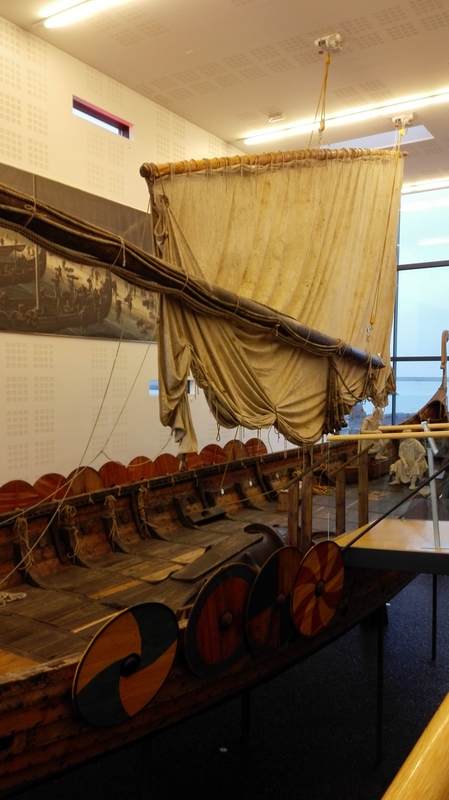 This museum had a few interesting artifacts, and many informative signs about the life of the Vikings, the discovery of Greenland and North America, and of the settlement on Iceland. I had a great time on this tour, it was very informative, and I was just happy to learn a little bit more about this amazing country. Of course there are a lot of things about this tour I could not tell, because Gummi told us so much I would be able to write half a book of it. 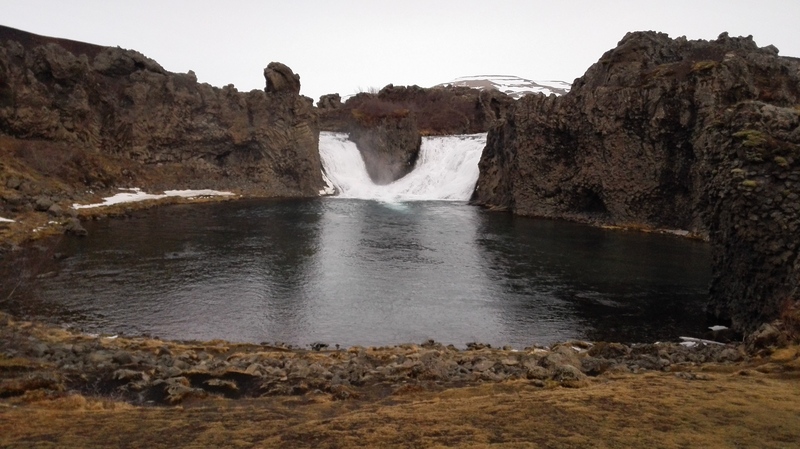 But if you are ever in Iceland do not hesitate to take this tour!